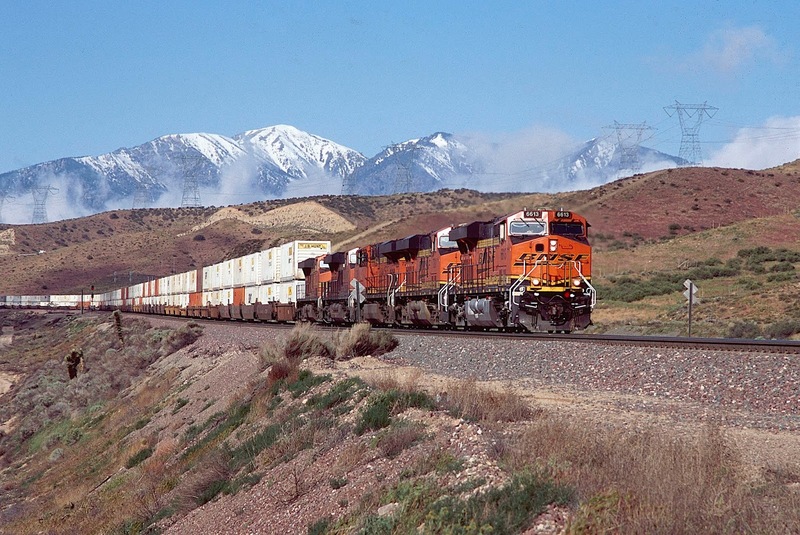 This is the last of the four part survey of BNSF's Transcon from Kansas City to Cajon. In this section, we will cross some of the most geologically interesting and active terrain in the world -- a portion of the "ring of fire" that surrounds the Pacific Ocean in both Asia and North America. 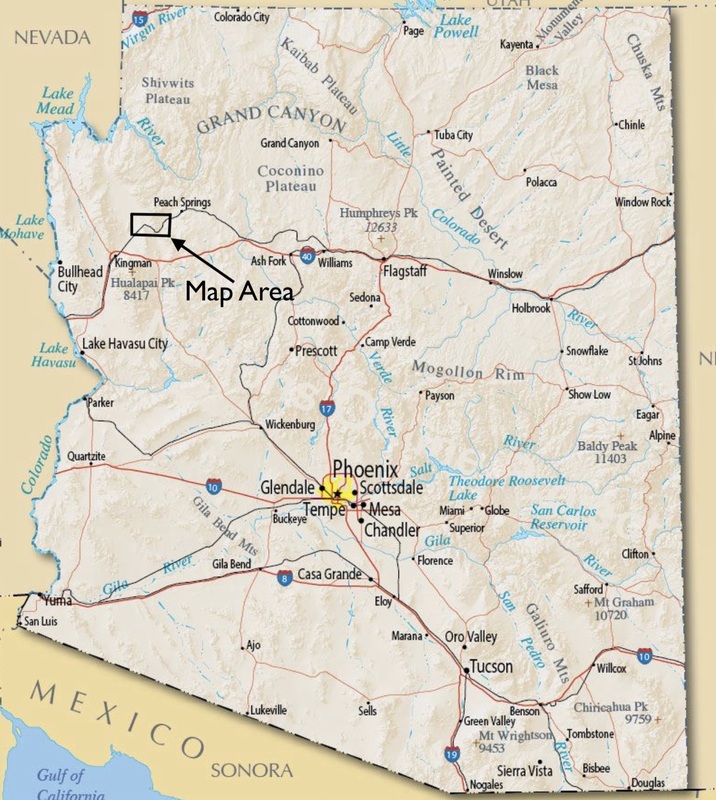 The territory here is harsh desert; most locations see less than five inches of rain per year. Driving across Interstate 40 today, or its father, old Route 66, or its grandfather, the National Old Trails Highway, the traveler has always felt one blown tire or broken fan belt away from catastrophe, for this isolated country does not suffer fools or wounded automobiles lightly. We will cross Crozier and Kingman Canyons, turn south down the Sacramento Wash to the Colorado River and Needles, California, which still today looks as though it has blown in from the dust bowl. 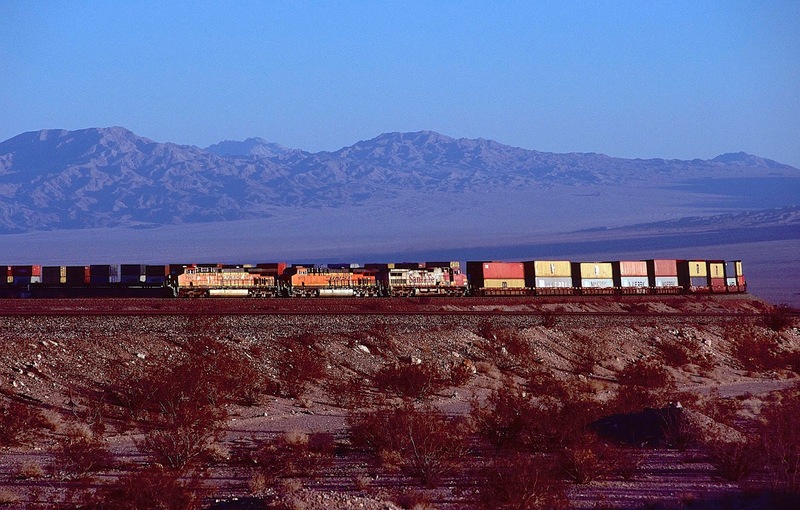 Then we will climb out of the river valley, up Goff's Hill, and strike out across the Mojave, which gives new meaning to "isolated" and "desolate." Eventually, we turn south again and struggle toward the Pacific Ocean across the San Andreas Fault at Cajon Pass, a region so torn apart by the movement of the Pacific and North American plates, like two giant monsters from bad Japanese movies pushing against each other, that the landscape appears to be deforming itself as you watch -- waiting for the "big one." As with previous installments, each photograph is numbered to correspond to its location on the map following each section. Again coverage is representative rather than inclusive. The text will indicate where the reader may find far more detailed posts on various sections of the railroad. The first concentrates on the history of this portion of the Transcon; the second on the geology. Both contain images from high up the canyon walls; the second contains photographs from the top. No need to repeat what has been covered in detail. Instead, let me point out that the Transcon makes a big northern loop from Seligman to avoid the several mountain ranges rising due west of town. 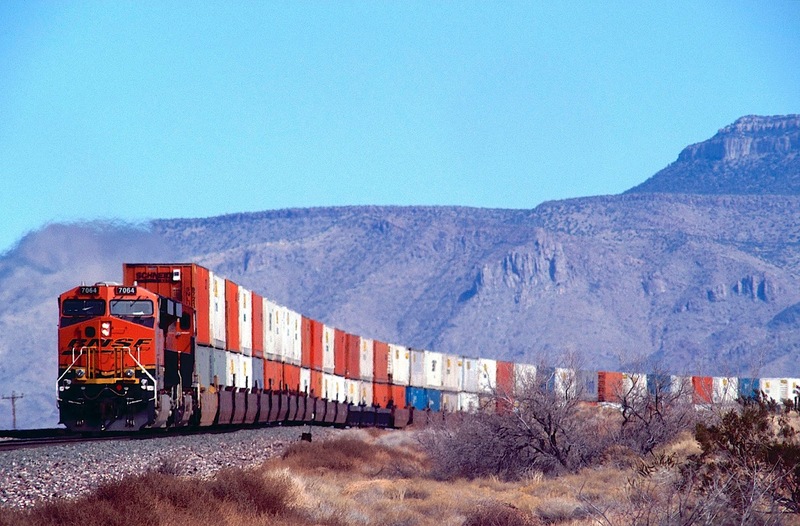 If you drive west of Seligman today on Interstate 40, you will note that the terrain is not suitable for railroad construction, especially considering that the route to the north has been used for trade and transportation for thousands of years. Crozier Canyon is very short, located between MP 479 and 481.5, and access is greatly restricted. Unless things have changed since my last visit, approaching from the east is impossible, because all roads are gated and locked. 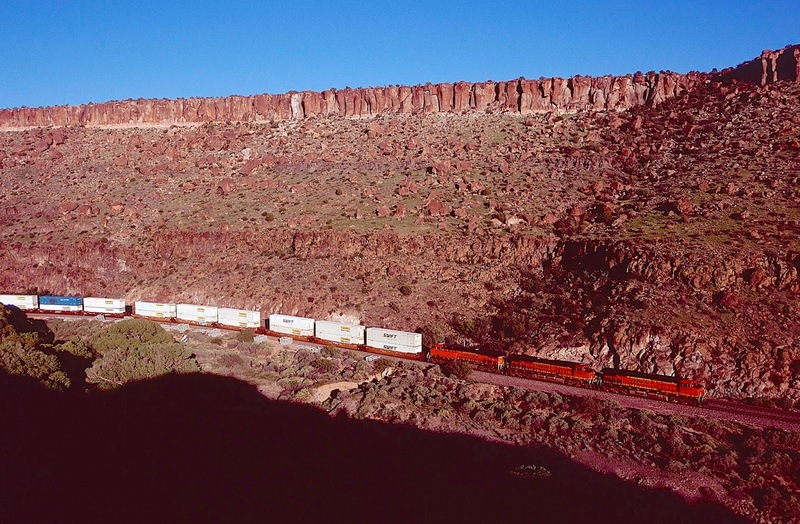 It is possible to follow railroad service roads from the west, but a significant hike is still required to reach the best shots in the canyon, especially if you desire to climb to the top of the south rim. As I hope some of the images show, however, the view from the top is magnificent and thus worth the effort. When climbing in places like Crozier Canyon, I sometimes wonder if I might make better use of my time. But then I remember that my two rules in life are: (1) Do no harm; (2) Leave no tracks. To my knowledge, I've never done harm to anyone while taking railroad photographs. Plus, I am very careful to disturb nothing -- no paper litter, no abandoned food, just a few shallow imprints from my hiking boots, which in this country will be blown away before the sun sets. One suggestion: If you hike into the canyon during the hot months (May through September), be sure and take plenty of water. In this desert climate, the air lacks humidity and heats rapidly. The canyon walls are granite, covered by a thick lava cap. Everything here radiates heat like a concrete parking lot. So take a hat, too. Even if you're not as old as I am (68 as I write this), you can grow very hot very fast in Crozier Canyon. West of the Canyon, the Transcon heads south through Valentine, then turns northwest to Antares, then pivots southwest toward Kingman. This portion of the line is easily accessible from old Route 66 and yields any number of wonderful images. Photograph #1: Stacks approach Crozier Canyon from the east. The Aubrey Cliffs rise in the background. Notice also the lava flow on the left that stops at the edge of the tracks. 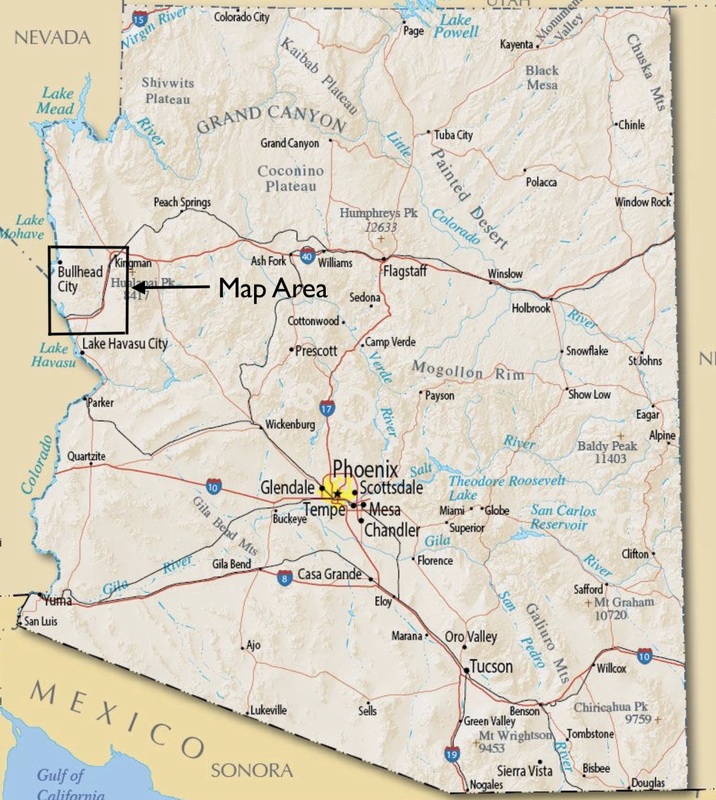 This location was was once home to multiple volcanoes -- demonstrated also by the lava cap at the top of the canyon. 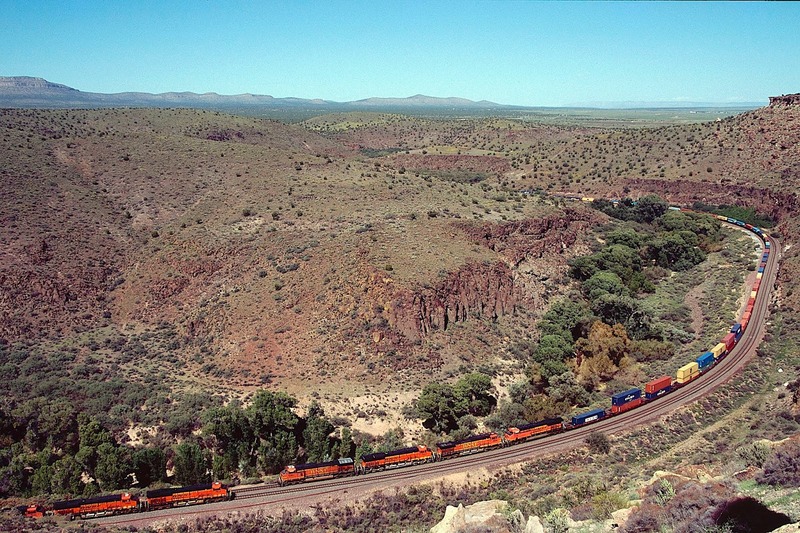 Photograph #2: Westbound stacks roll downgrade through the labyrinth of Crozier Canyon. The Grand Wash Cliffs rise in the upper left, while the upper right shows the valley through which westbounds pass before entering Crozier, which rises from the ground like a wall -- the result of eons of volcanic activity. Photograph #3: Westbound autos from ground level. Note the lava cap at the top, the result of multiple eruptions, which makes climbing to the south rim difficult and hazardous. Note also the trees to the left of the train, without leaves during January. This area is much too dry to support woodlands, but a spring supplies water year around to the canyon floor, which sustains the vegetation. Photograph #4: A meet deep in Crozier Canyon during the summer. The trees in the canyon floor are fully leafed. Photograph #5: Another meet in Crozier Canyon. Photograph #6: Westbound at dusk. 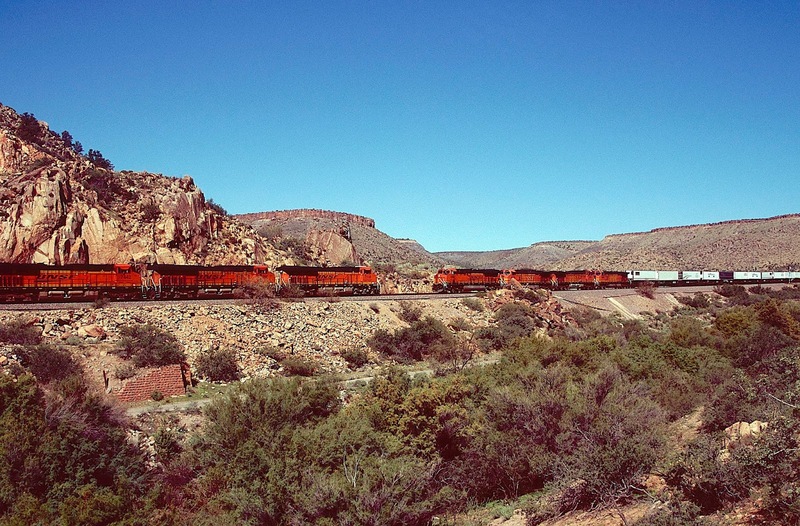 Photograph #7: An eastbound manifest prepares to enter Crozier Canyon from the west. 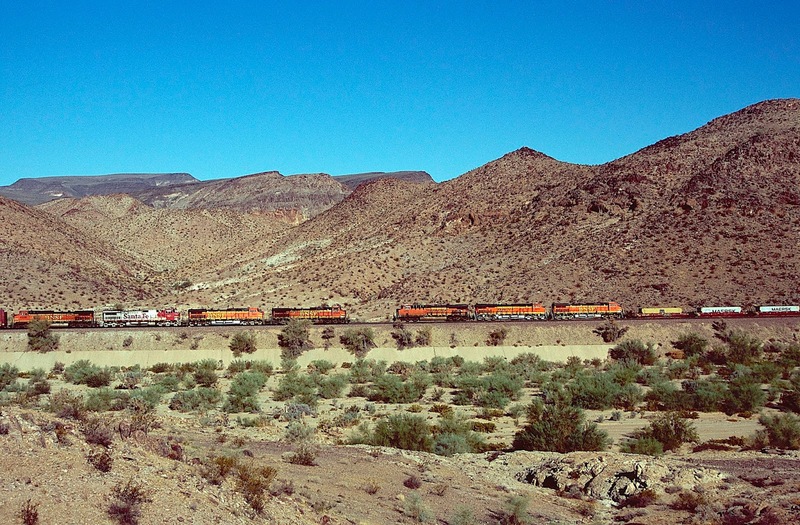 Photograph #8: Westbound stacks leaving Crozier Canyon, with the Grand Wash Cliffs in the background. 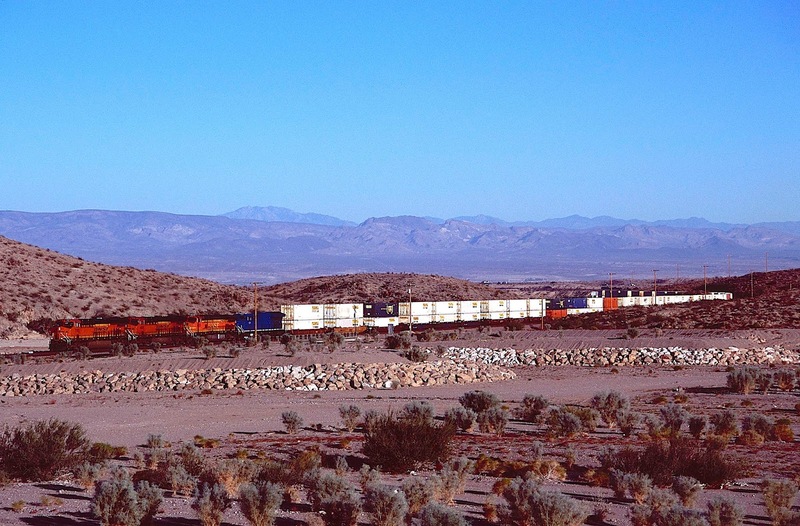 Photograph #9: Westbound trailers have left Crozier Canyon and are meeting an eastbound manifest beside old Route 66 and Truxton Wash. The power on the trailers is heading compass south. 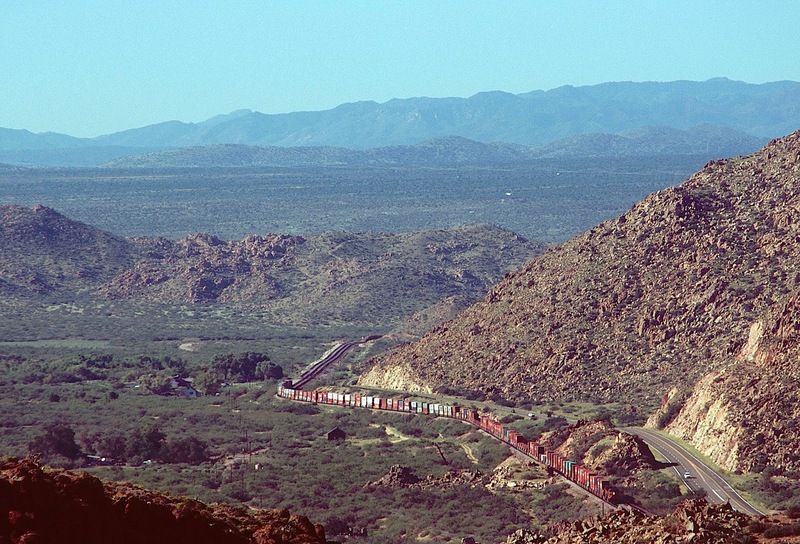 Photograph #10: Westbound stacks are passing Valentine, Arizona, the site from 1901 to 1937 of a Native American school that educated (some say indoctrinated) portions of the Hualapai Nation. Non-Native Americans were educated in a separate building which closed in 1969. 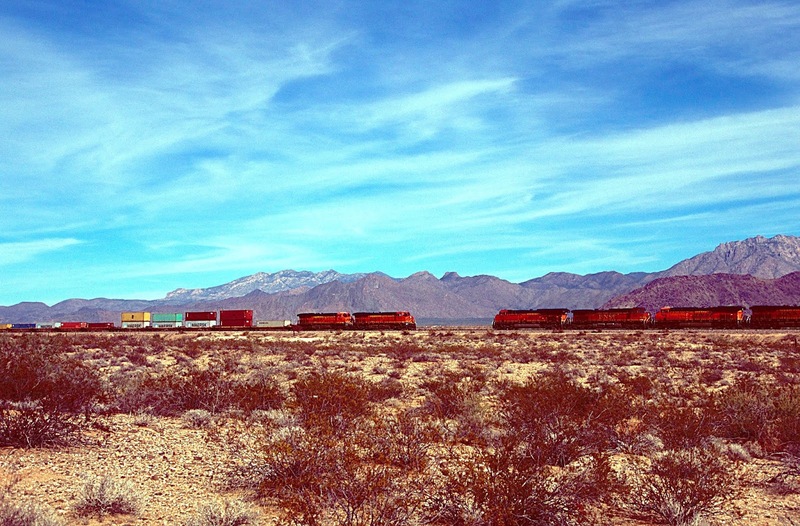 Photograph #11: A meet near Valentine, Arizona. Photograph #12: Eastbound stacks at Antares, an old timetable location on the A.T.&S.F. at MP 495.1 in the middle of a two mile long curve. Photograph #13: Pushers on eastbound stacks at Antares. That article, however, does not discuss a geologic puzzle that, to my knowledge, has not been solved. Kingman Canyon, another short canyon on the scale of Crozier, is surrounded by a thick layer of basalt at the top. Basalt is a dark, fine-grained volcanic rock that sometimes displays columnar structure and bubbles up from underground as lava. Because of its low silicon content, it flows easily and quickly away from a volcano, allowing gases to escape without generating an enormous eruption. Where did the basalt at the top of Kingman Canyon come from? 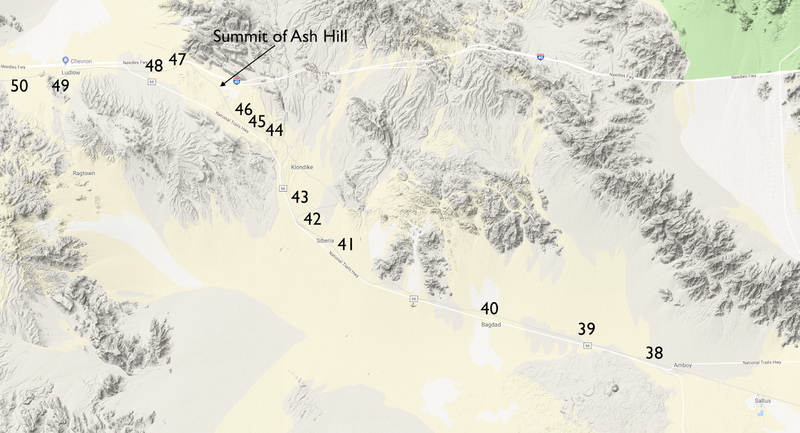 The only evidence of volcanism lies south of Kingman, but the terrain south of Kingman slopes to the south. Basalt from that direction would have had to flow uphill, which it does not do. Assume that there existed some sort of rock formation south of Kingman, like a dam, that caused the basalt flow to back up to the north. What happened to that rock formation? It apparently has vanished without a trace. South of Kingman today is a huge valley between mountain ranges that shows no evidence of ever having supported a basalt flow. So I repeat? 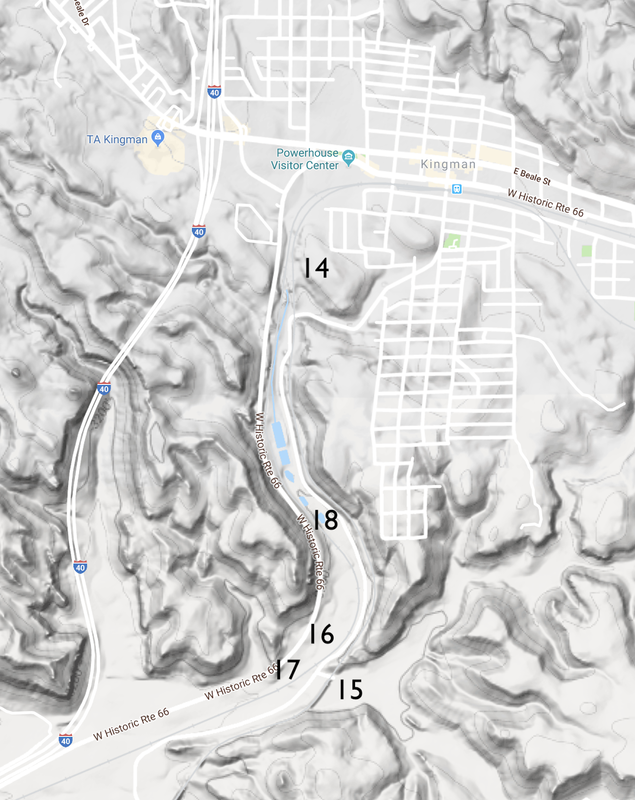 Where did the basalt surrounding Kingman Canyon come from? You might suggest that eons ago a volcano erupted north of Kingman, all traces of which have been erased by erosion over millions of years. Well, north of Kingman is another huge valley. The Transcon runs down the middle of it. There is no evidence at all of basalt ever having flowed through that valley. 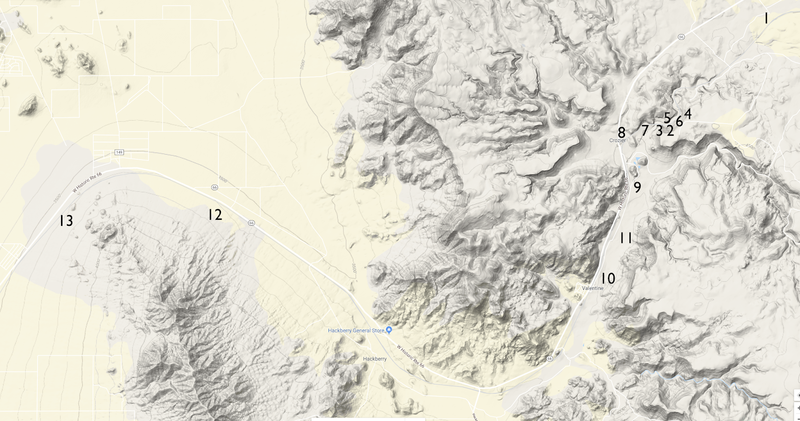 Has the basalt north of Kingman also eroded away? If so, why is there still basalt surrounding Kingman Canyon? No one knows. Over the course of my life, I've come to understand that "no one" knows a lot of things. 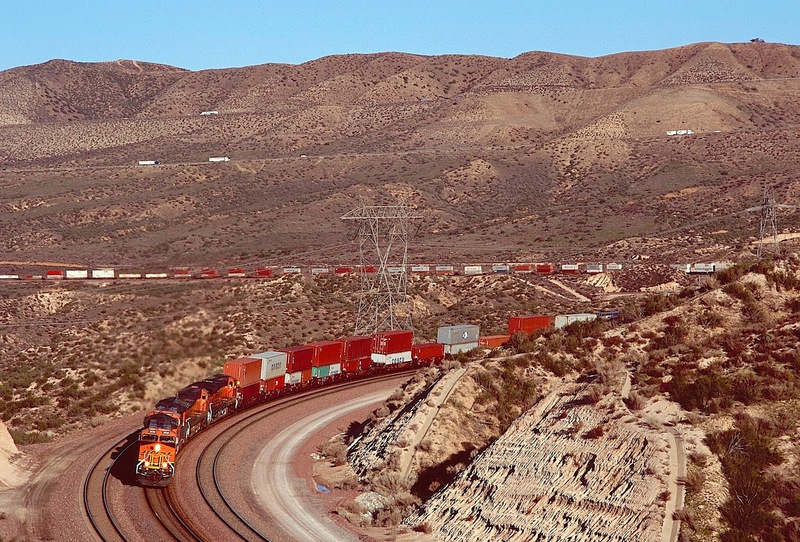 Photograph #14: Westbound stacks are meeting eastbound autos at the northern mouth of Kingman Canyon. The basalt discussed above is clearly visible above the auto racks. 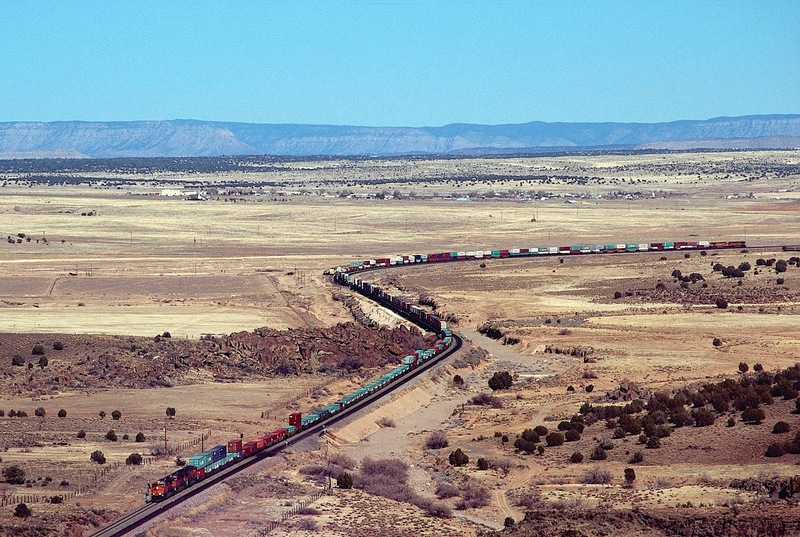 The line in the foreground was built by the Atlantic and Pacific Railroad in 1883, while the second line in the background was constructed by the Santa Fe in 1923 with a shallower grade (1.4 percent as opposed to 1.8 percent) for eastbound traffic. Photograph #15: An eastbound climbs the 1923 line across Bridge 518.6X. Just to the left of the image is a small rifle range where residents from Kingman frequently come to shoot. Sometimes they fire off rounds into the air. While railfanning here, I have heard bullets whizzing overhead. 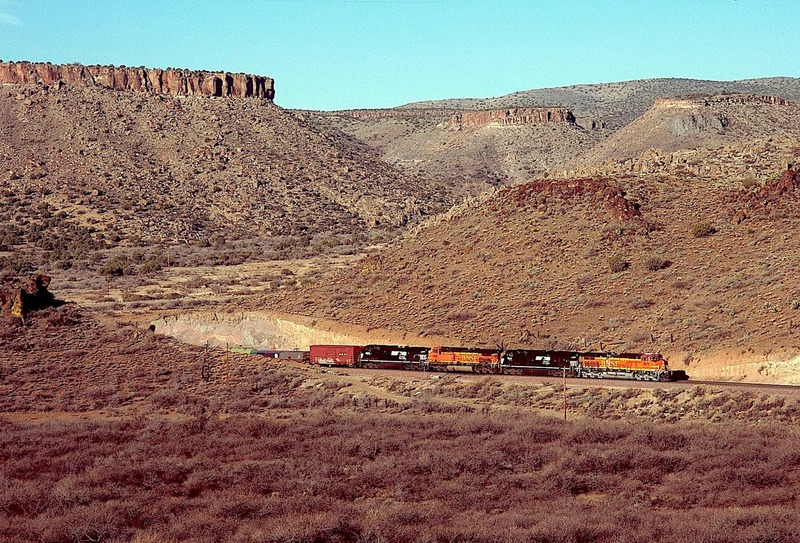 Photograph #16: Pushers on westbound stacks are exiting the south end of Crozier Canyon on the original 1883 grade. The 1923 line is visible above the stacks. 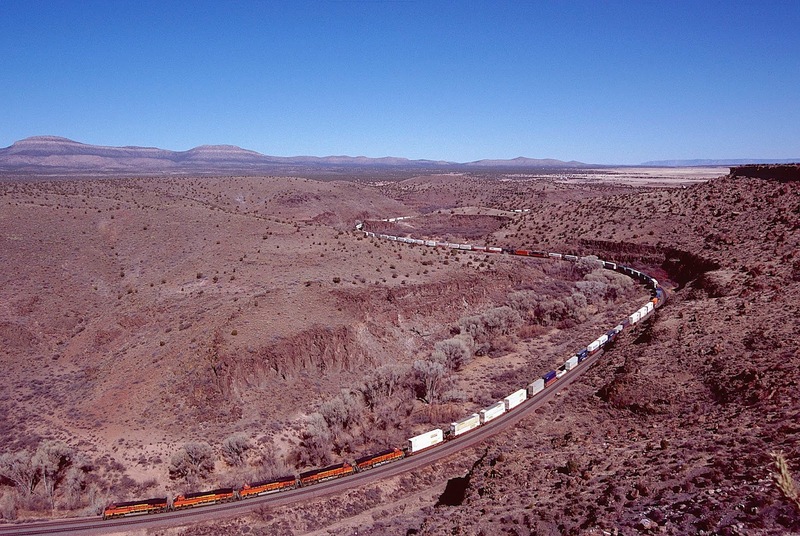 Photograph #17: A westbound intermodal train is exiting the south end of Kingman Canyon. Above the power is old U.S. 66. Below is a remnant of the even older National Old Trails Highway -- the original route across the Southwest to California. On the right is the 1923 grade and Bridge 518.6X. 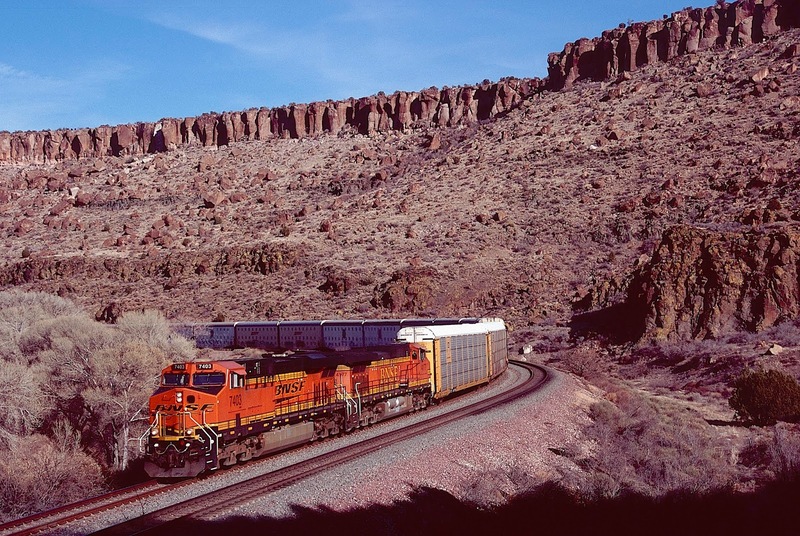 Photograph #18: Westbound stacks roll through the middle of Kingman Canyon. 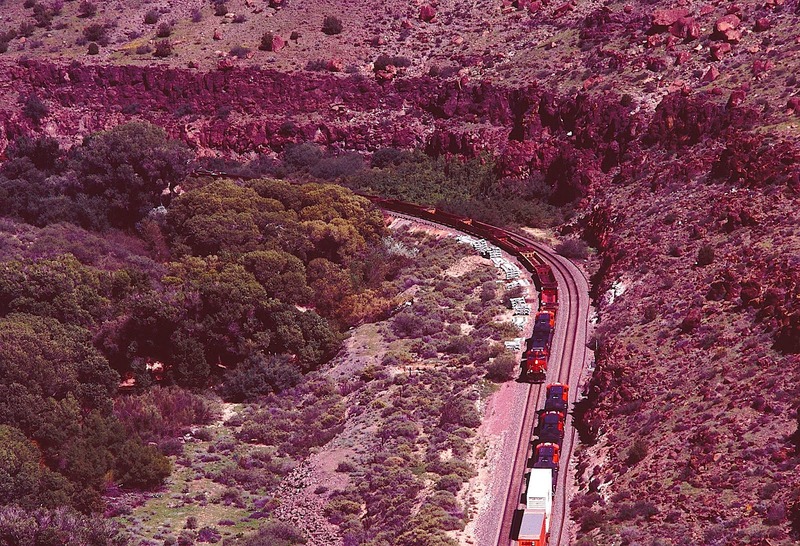 The 1923 line hugs the canyon wall above the train. Beyond the ridge above the stacks lies Kingman in a narrow valley. Beyond the valley is another ridge with the classic "K." Virtually every western town has the first letter of its name emblazoned on a nearby hillside. This is a fascinating area in which a few, leather-skinned desert dwellers attempt to carve out a barely sustainable living. Chrysler has also located its Jeep proving grounds in this valley, a good place to test the prowess of the latest Jeep Wrangler. 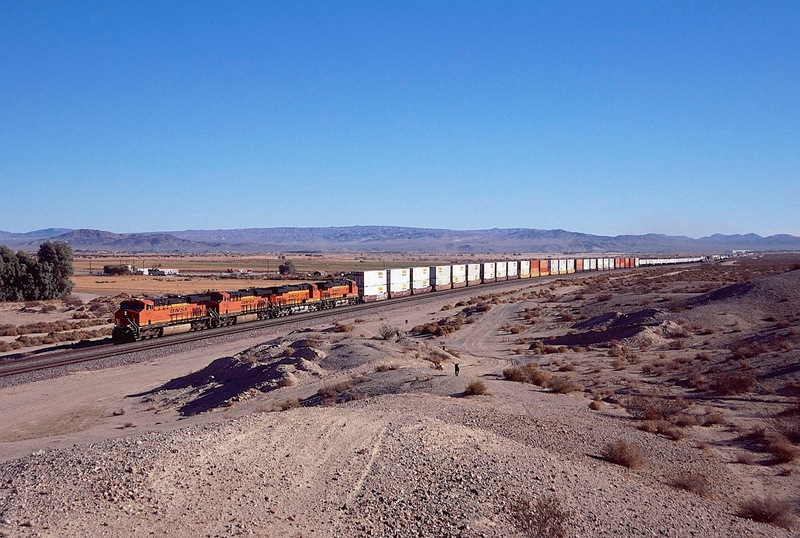 Photograph #19: Two BNSF stack trains meet in the Sacramento Valley, which opens to the south of Kingman Canyon -- a harsh desert that sees a few inches of rain per year. 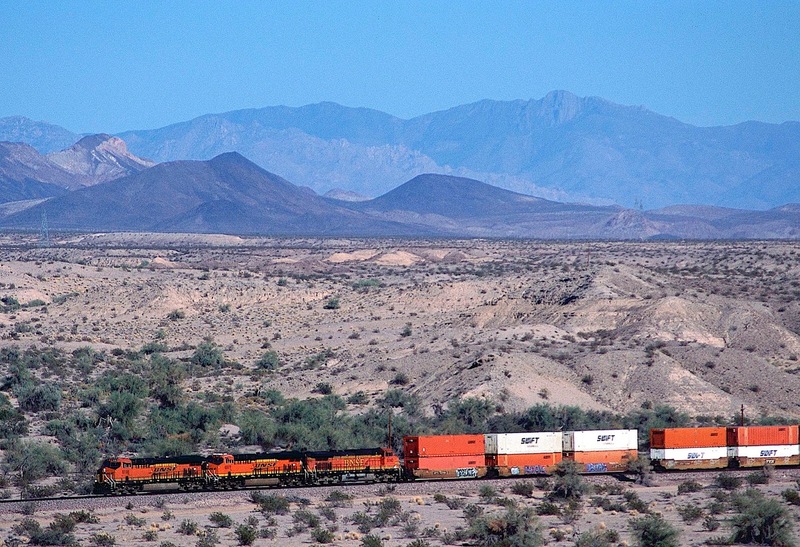 The Hualapai Mountains rise in the background on the eastern side of the valley. The western side is bracketed by the Black Mountains, filled with volcanic lava. 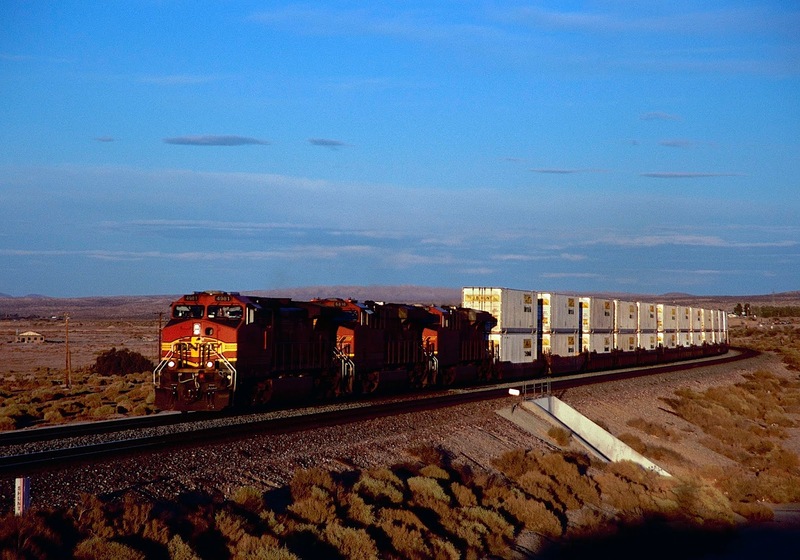 Photograph #20: Eastbound stacks are crossing Bridge 544.6 across the Sacramento Wash at the southeastern edge of the Black Mountains. The bridge is a portion of 70 degrees of curvature that turn the tracks from south to west -- to go around the south end of the Black Mountains. 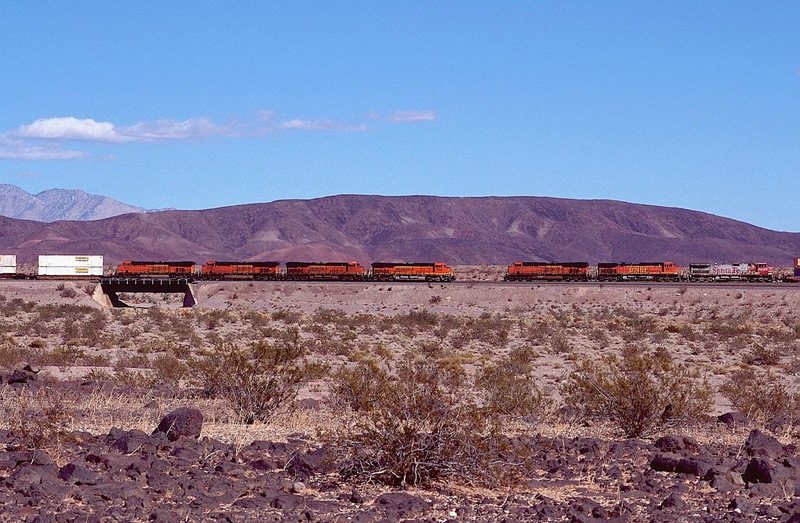 Photograph #21: Two stack trains meet at the base of the Black Mountains. The Sacramento Wash is in the foreground, filled with creosote bushes. A dry wash like this is one of the creosote bush's favorite habitats. Photograph #22: Another meet beside the Black Mountains. 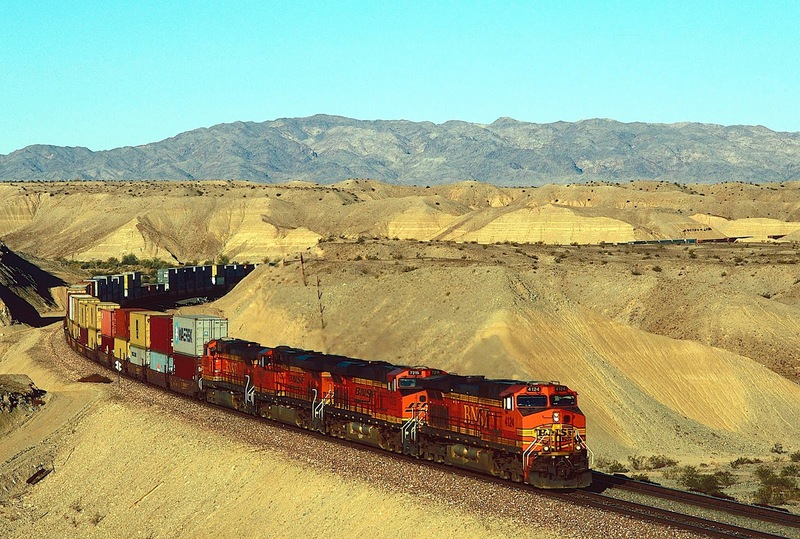 Photograph #23: Eastbound stacks (compass northeast) are climbing the grade up the Sacramento Wash, with the Dead Mountains in the far background. 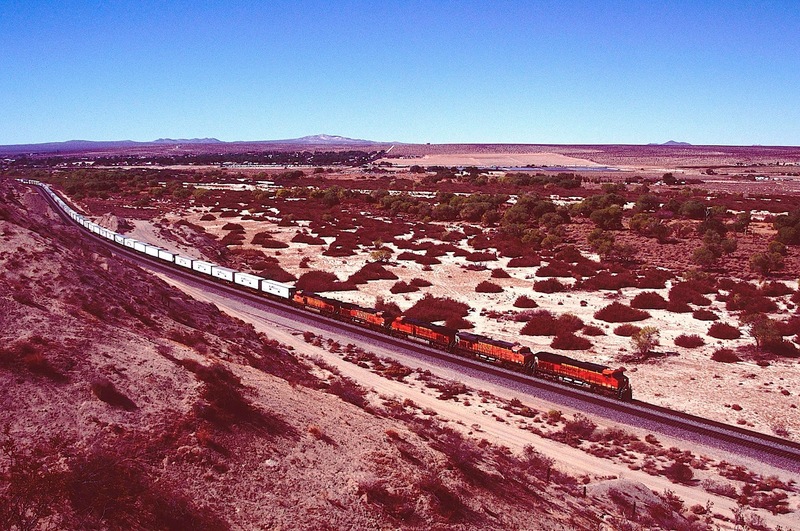 The slope immediately behind the train is solid lava. 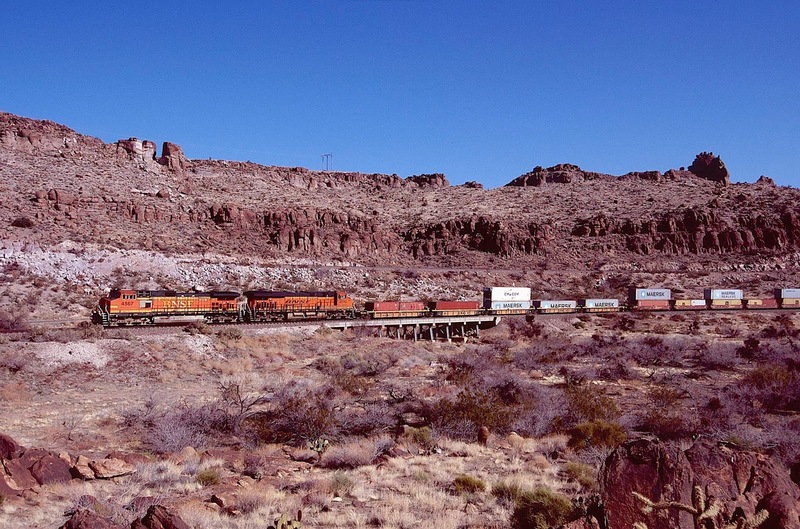 Photograph #24: Westbound stacks are approaching the Colorado River. 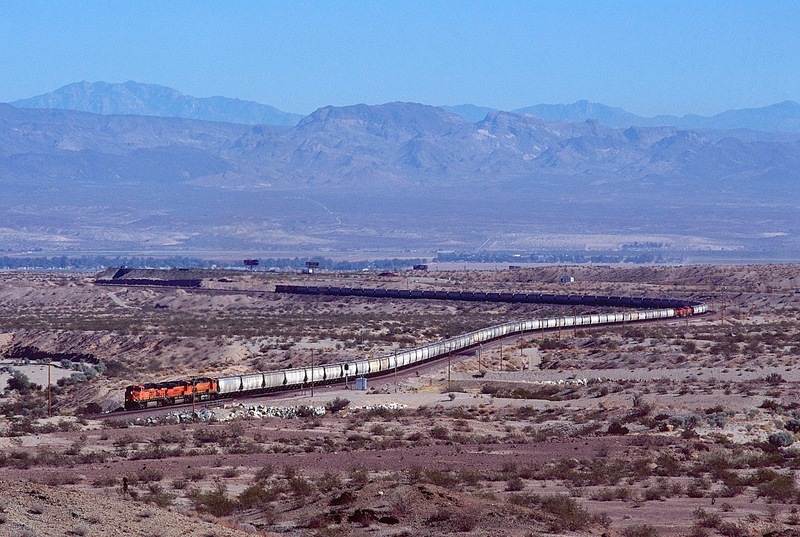 The Transcon has now turned from south to west on its trek around the base of the Black Mountains, the dark lava of which is in the background. Above the Black Mountains rise the Hualapai Mountains. The Sacramento Valley lies between the two mountain ranges. 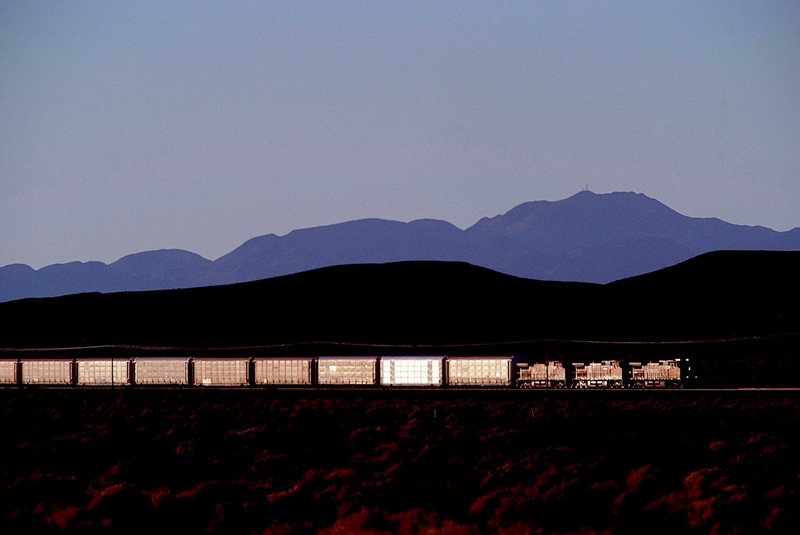 Photograph #25: A meet of two auto trains beneath the Black Mountains. 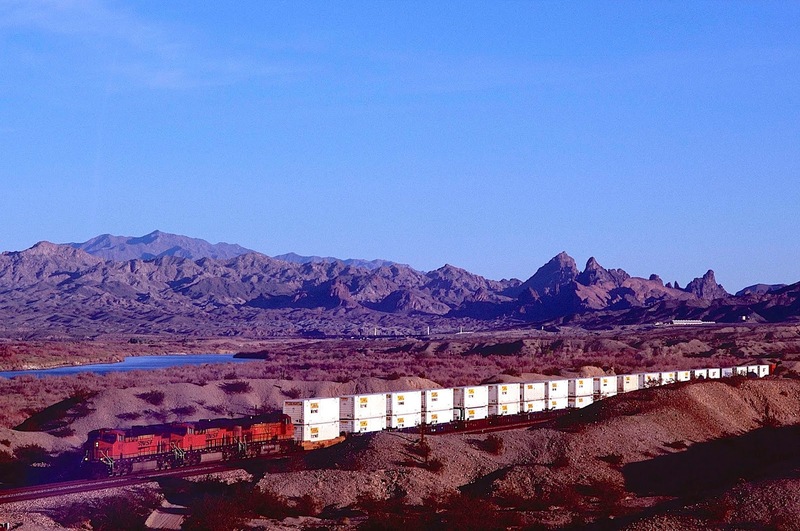 Photograph #26: BNSF 4617 West leads stacks across the Colorado River into California. "Polish comes from the cities; wisdom from the desert." Frank Herbert. "Use every man after his desert, and who should scape whipping?" William Shakespeare. "I don't look like a desert person because I stay indoors most of the day and fool around at night. That's what the desert animals do - they don't have a tan either." Captain Beefheart. "I've accompanied several dying people on their travels, and the desert seems to be a favored destination." Edmund White. "If you put the federal government in charge of the Sahara Desert, in 5 years there'd be a shortage of sand." Milton Friedman. 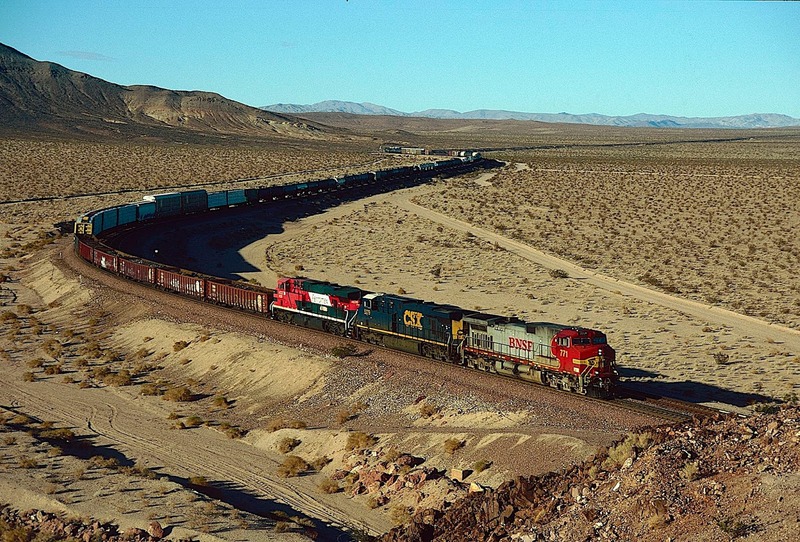 The Transcon has now crossed the Colorado River into California and is entering one of the harshest deserts in North America -- the Mojave. Even in the 21st century, this stretch of "no man's land" is forbidding, desolate, overwhelming, awe-inspiring, horrible -- the adjectives flow like blood from a wounded horse left to die in the sun. As with the rest of this Transcon survey, this section concentrates on the highlights. The above post goes into much greater detail. Both the original post and this section, however, concentrate on the extreme isolation and desolation of this small corner of the globe. Virtually everywhere I have traveled in these United States, I have found at least a few stubborn contrarians scratching out a solitary and miserable existence, but not here -- not in the Mojave. You will drive for miles and see nothing, especially if you follow old Route 66 and avoid Interstate 40. The old road follows the Transcon from Arrowhead Junction across the absolute worst of the badlands to Ludlow. I have traveled this route several times and more than once have not seen another vehicle for over 50 miles. When I stop to allow Bear the Mighty Dog to stretch his legs, he looks around at the sand and rocks, then up at the unrelenting cloudless sky, then back at me, warily, as if to say, "How in the world did we end up here?" 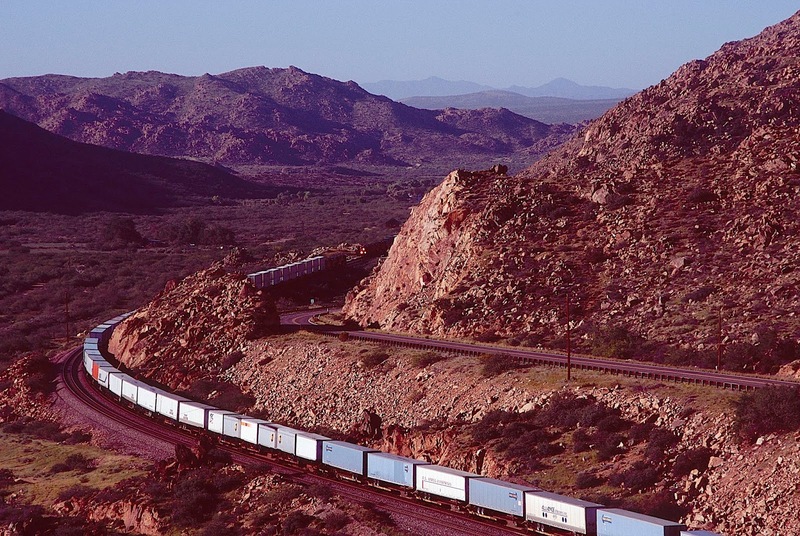 In this section, we follow the Transcon from Needles, a division point, to Goffs, the summit of the railroad's climb out of the valley of the Colorado River. Goffs' Hill strains even the fastest westbound Z-trains and allows one, if so inclined, to chase trains (especially heavy ones) up the grade to what now appears to be a ghost town. Goffs was once a stop on old Route 66 until the road was realigned in 1931. Then the town shriveled. The last time I drove through, I saw no signs of habitation. The roofs on the few remaining structures had either completely collapsed or were in the process of collapsing. A few derelict vehicles, rusted, with no windows or tires, lay half-covered with sand. I saw a cow's white skull and what I believed to be a dog's skeleton. Mighty Dog did not even both to sniff it. 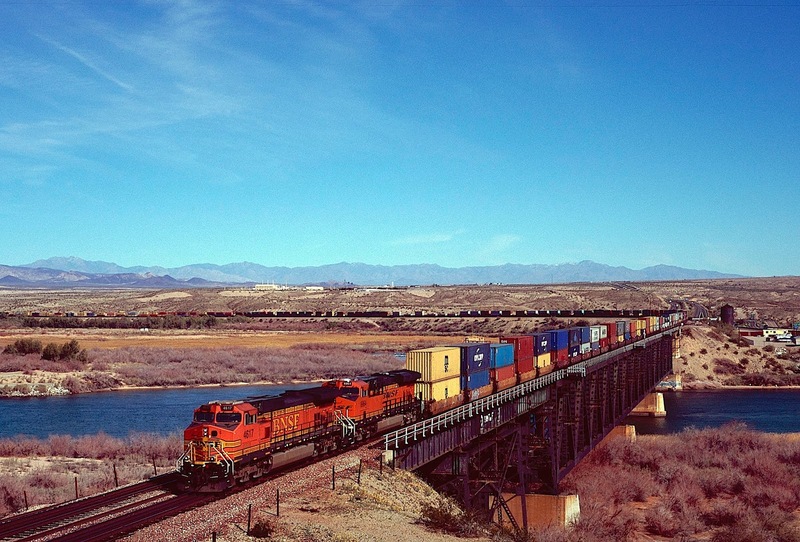 Photograph #27: Westbound stacks have crossed the Colorado River and are rolling compass north towards Needles. The rock formations in the background gave the town its name. 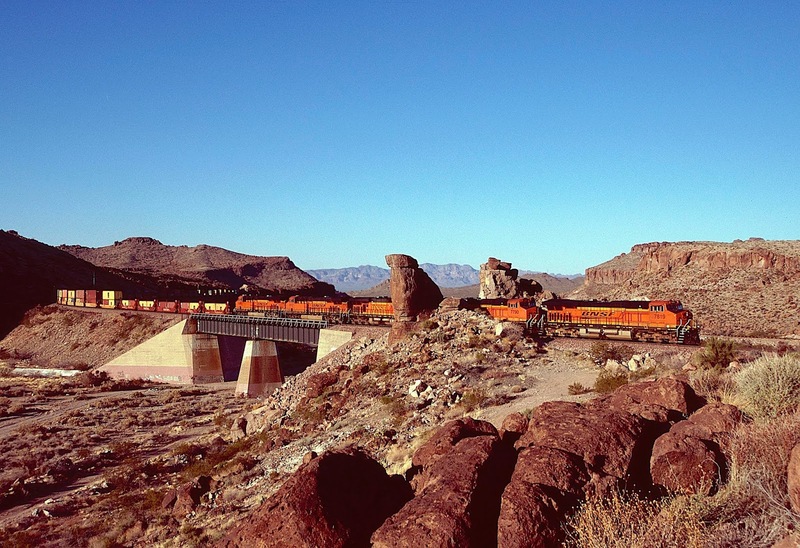 Photograph #28: This eastbound train is preparing to cross the Colorado River, with the Dead Mountains in the background. 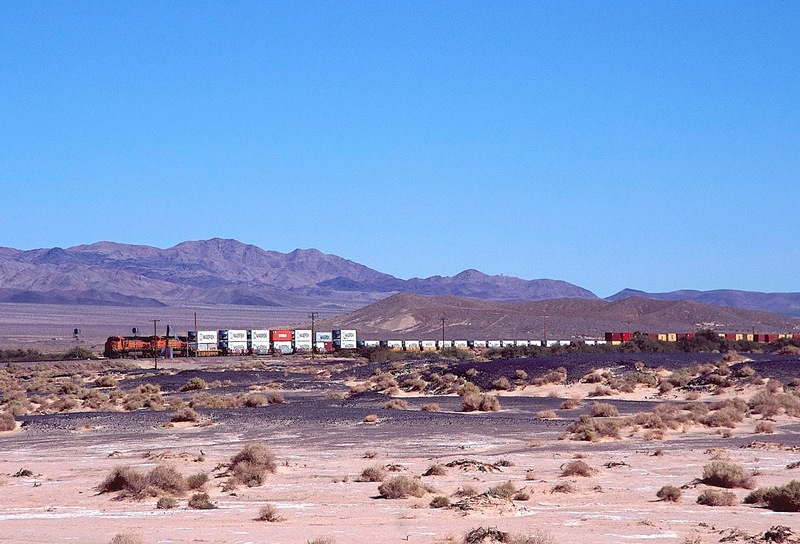 Photograph #29: This westbound mineral train is struggling up the grade west of Needles. Photograph #30: Westbound stacks on Goffs' Hill. Photograph #31: Westbound stacks are climbing Goffs' Hill beside the appropriately named Dead Mountains. 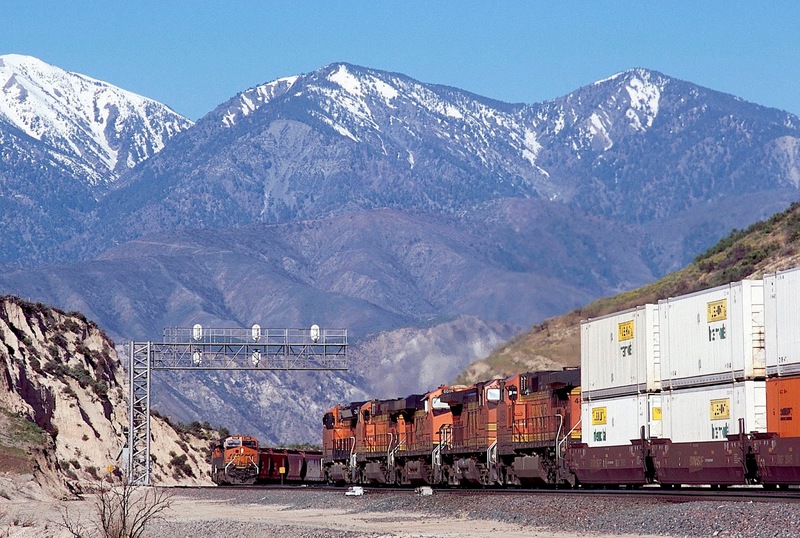 Photograph #32: More westbound stacks and more Dead Mountains. 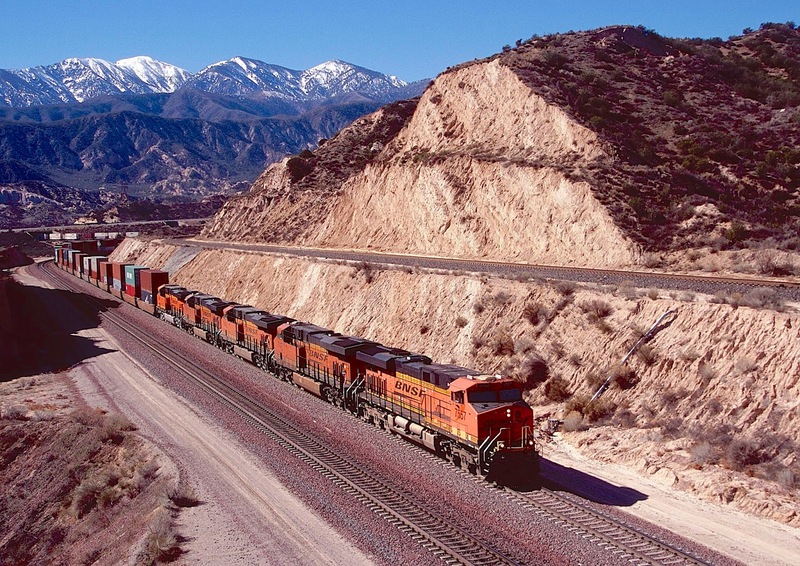 Photograph #33: BNSF 6754 West has just crossed U.S. Highway 95 at Arrowhead Junction, where the two tracks divide. This train is on the line that takes a more circuitous route up the hill for westbounds, while the near track curves to the right at the edge of the image and runs straight downgrade for eastbounds. 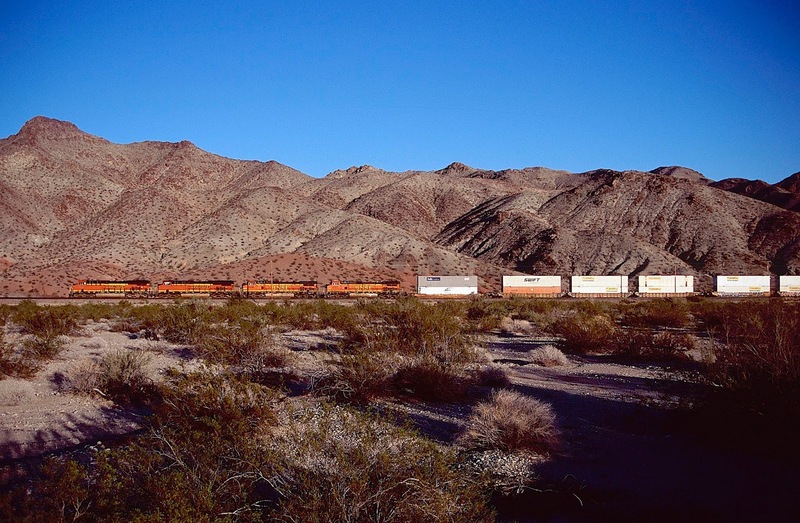 Photograph #34: BNSF 4230 West, one of the "hottest of the hot" Z-trains, is climbing Goffs' Hill on a warm January day in the Mojave. Photograph #35: A meet on Goffs' Hill. Photograph #36: Another meet on Goffs' Hill. Photograph #37: And another. 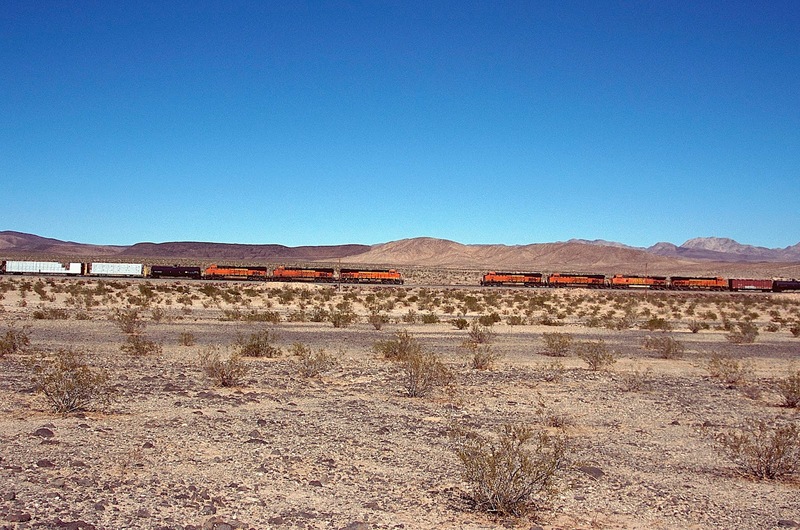 The ghost town of Goffs, the top of the hill, is about one-half mile to the left (west) of this image, which gives a stark view of the desolate Mojave Desert. "The Mojave is a big desert and a frightening one. It's as though nature tested a man for endurance and constancy to prove whether he was good enough to get to California." John Steinbeck. “Your will is free means: it was free when it wanted the desert, it is free since it can choose the path that leads to crossing the desert, it is free since it can choose the pace, but it is also unfree since you must go through the desert, unfree since every path in labyrinthine manner touches every foot of the desert’s surface.” Franz Kafka. “I am convinced now that the desert has no heart, that it presents a riddle which has no answer, and that the riddle itself is an illusion created by some limitation or exaggeration of the displaced human consciousness.” Edward Abbey. 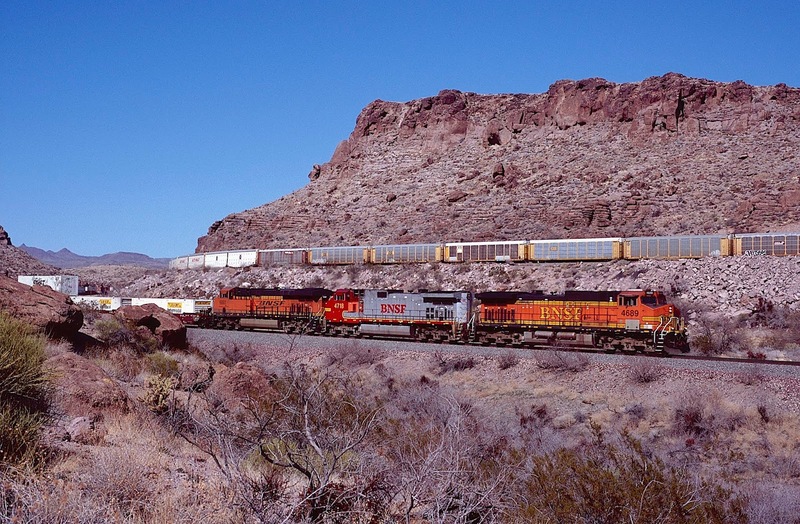 From Goffs, the tracks turn southwest, cross under Interstate 40, and run along the eastern edge of more desert mountains. 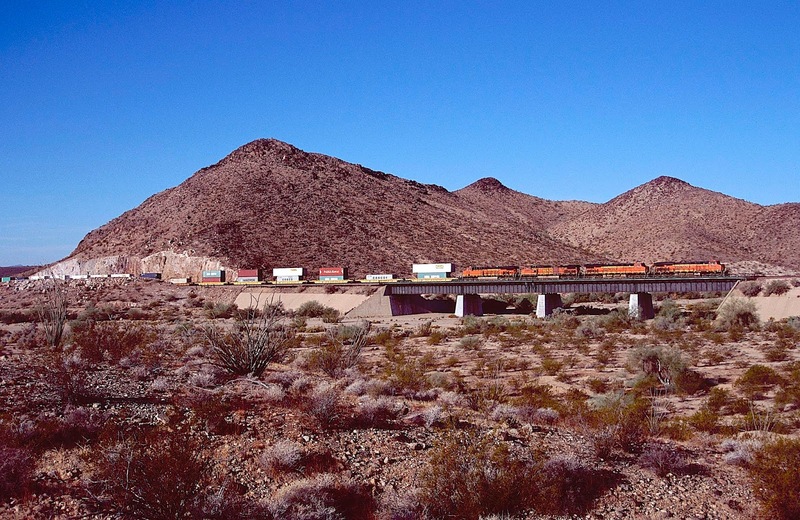 Old U.S. 66 follows the Transcon for a short distance, then the road heads into the hills, as though announcing to the world that it wants no part of what is to come -- the worst of the Mojave. Now the railroad is truly alone. If the desert had a heart, which Edward Abbey claims it does not, it would be right here, right where nothing but rock and heat and sand and cloudless sky can survive. There are a very few sandy trails that lead into this wasteland, but I have never followed them. I may be crazy, but not that crazy. Then the tracks reach Cadiz. I assume it was named after the Spanish port, but the railroad pronounces it to rhyme with "ladies." 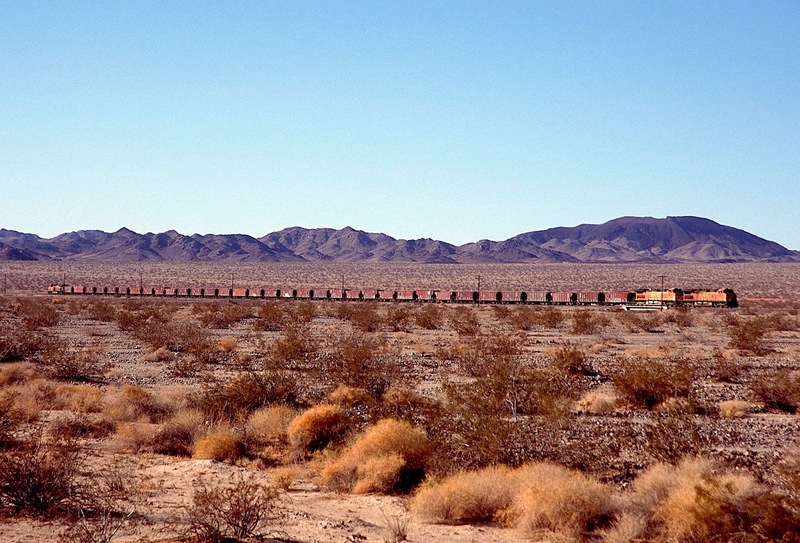 At this location, the tracks are only about five miles south of old U.S. 66, which the State of California still maintains, but they might as well be across an ocean or even a galaxy. 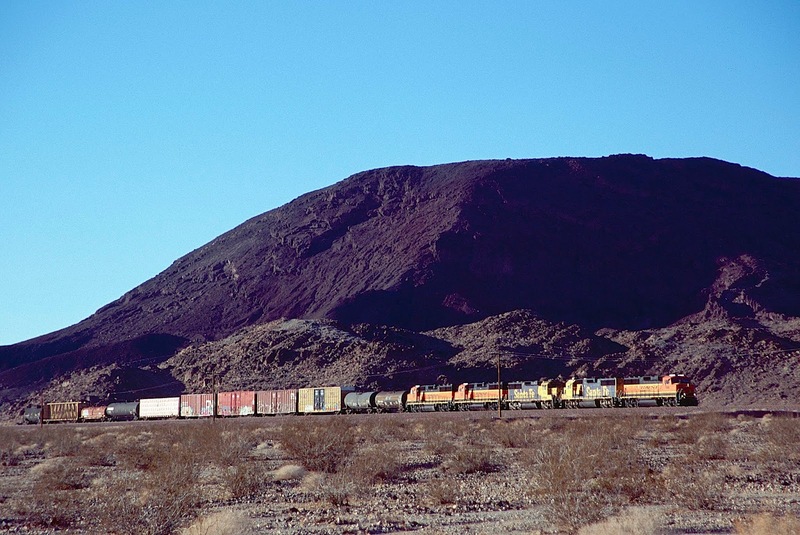 Not until you reach Amboy does the Transcon return to what passes for civilization in this moonscape. 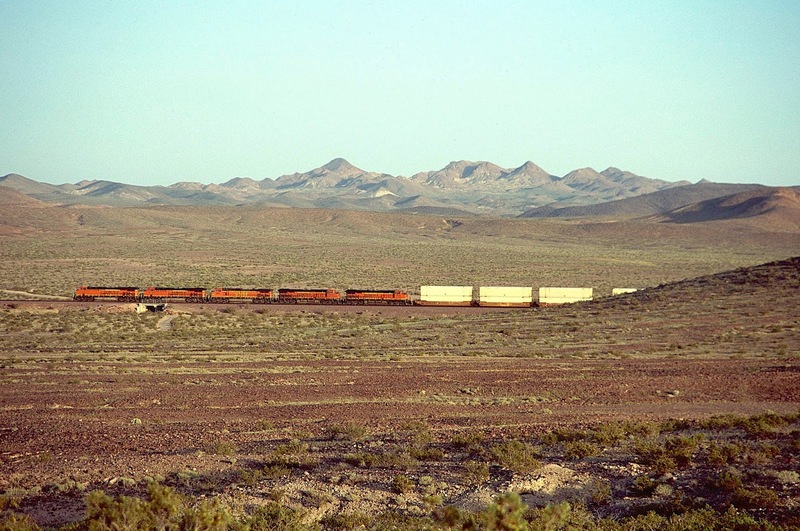 Lewis Kingman, a locating engineer for the Atlantic and Pacific Railroad, created Amboy as one of a series of railroad stations constructed across the Mojave Desert. Before the construction of Interstate 40, this small settlement supported a motel and restaurant which, I am sorry to report, were closed the last time I drove through in October of 2018. This section of our Transcon survey begins at Amboy and extends to Ludlow, where Interstate 40 rejoins the tracks. Along the way, we will pass, inter alia, Siberia and Ash Hill, giving you some idea of what Lewis Kingman thought of this country. 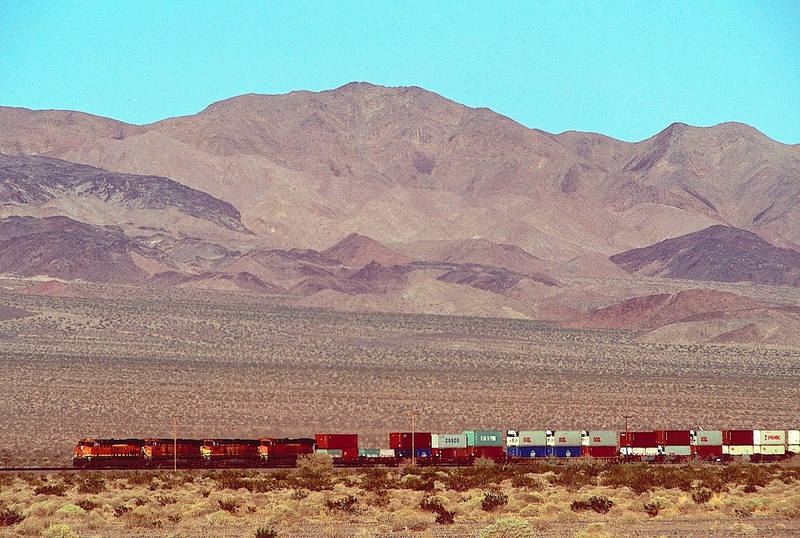 Photograph #38: Westbound stacks have just passed through Amboy on their way to Barstow. 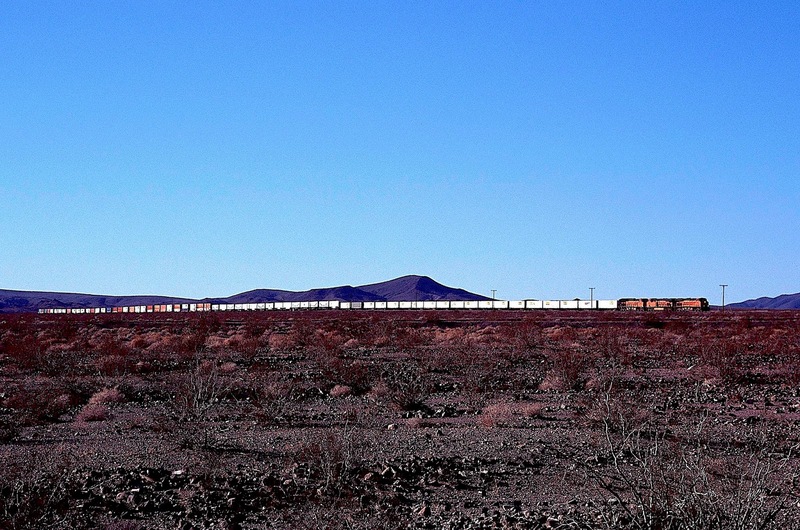 Photograph #39: I do not know what this short, eastbound mineral train was carrying but even with over 9,000 horsepower, it was struggling across the almost flat terrain west of Amboy. The mountains in the background (part of the Amboy volcanic field) are the result of volcanism occurring many millions of years ago. Even today, nothing can grow on them -- not even the ubiquitous creosote bush. Photograph #40: Here is Bagdad. I have been told that this is the local from Barstow to Needles. Since there is literally nothing between those two towns, I do not see why a local would be needed. Nonetheless, what do I know? In the background is another mountain composed of lava from ancient volconism. I believe this is the remnant of a cinder cone in the Amboy volcanic field. 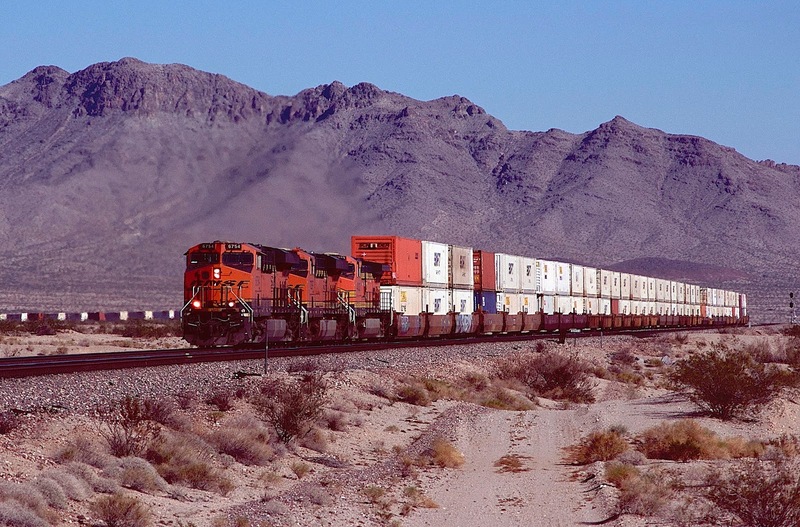 After posting this article, my friend Dale Jacobson sent me a note explaining the Barstow to Needles local. 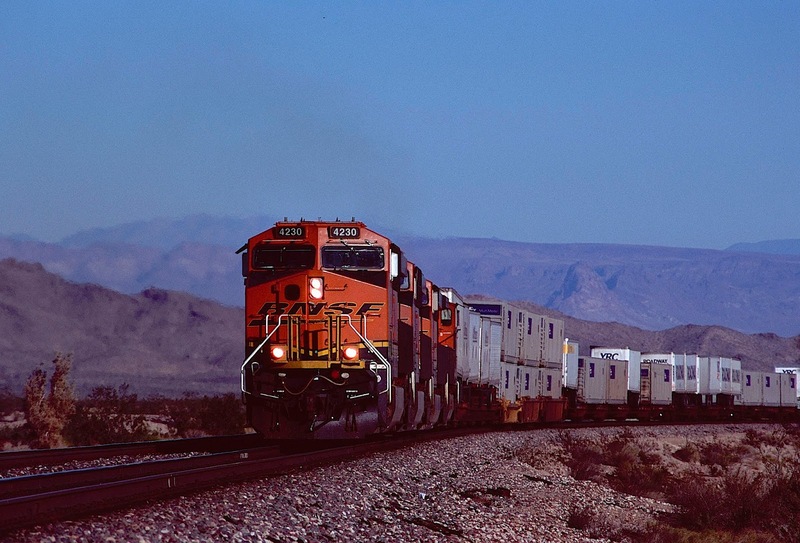 Dale, thank you for the following information: "The main reason for that BNSF local between Barstow and Needles is to interchange traffic with the Arizona California RR (AZCA) at Cadiz. While the AZCA is now a Genessee Wyoming property I THINK it still has retained the right to use its old green and cream paint scheme. 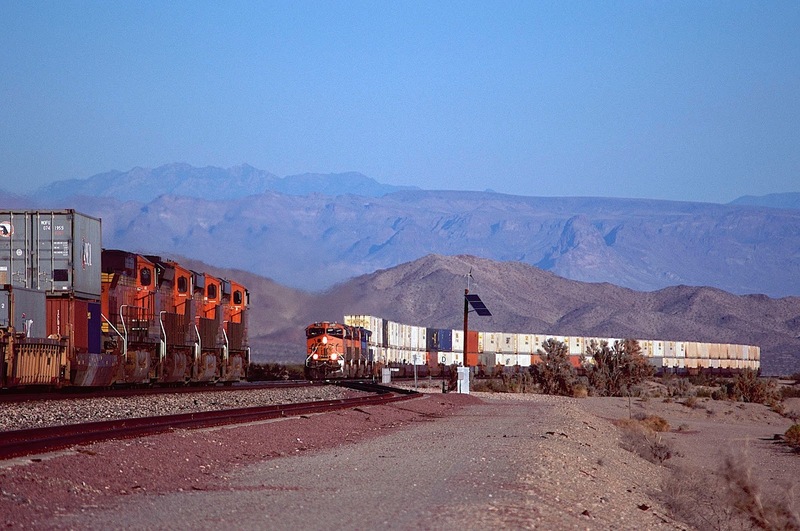 Norm [Schultze] and I caught the AZCA and BNSF locals meeting at Cadiz some years ago on one of my few trips across the Mojave. I don't know when that interchange occurs now, but when we were there it occurred about 'high noon.'" Photograph #41: An eastbound Z-train has just rolled off Ash Hill and is passing Siberia. Photograph #42: Just west of Siberia, the tracks divide. The original grade turns almost due north and begins the climb up Ash Hill. The second track turns almost due east, then turns back northwest, taking a more level grade up the hill, to rejoin the original line near Klondike. 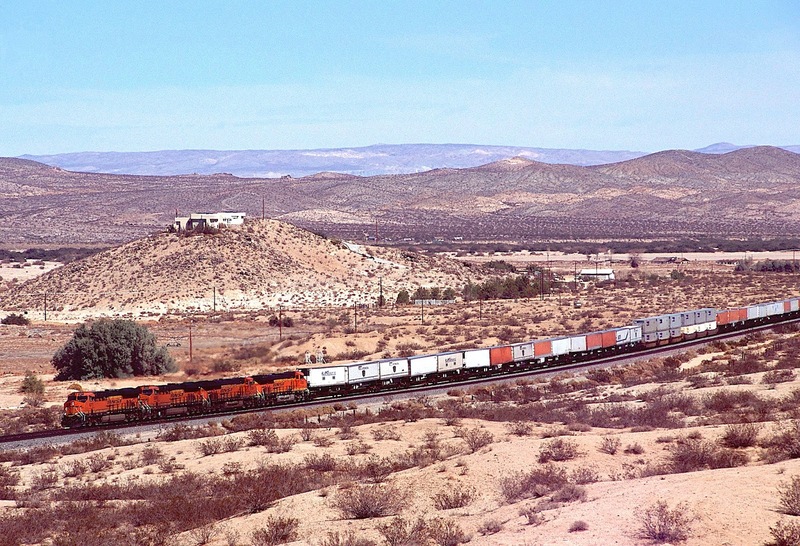 In the image above, westbound stacks are beginning to curve back to the east, while the line in the foreground is running almost due north up the hill. You can clearly see the steeper grade on the nearer track. Generally, westbounds take the shallower grade, though not always, especially when westbound Z-trains are running around slower westbound freights. 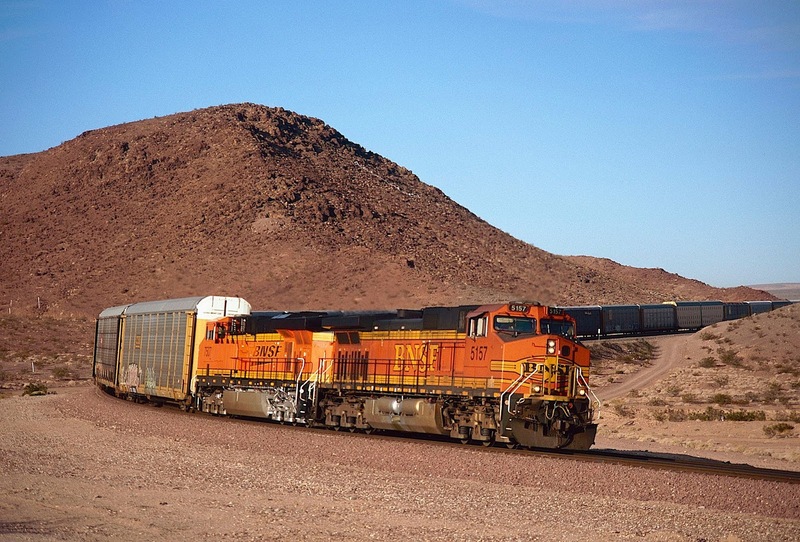 Photograph #43: BNSF 5094 East is roaring down the steeper track on the east side of Ash Hill, which is named for the ash and lava (mostly basalt) that cover this territory like a heavy snowfall. For example, the peak in the background was created by an enormous volcanic eruption, like the other mountains we have seen. 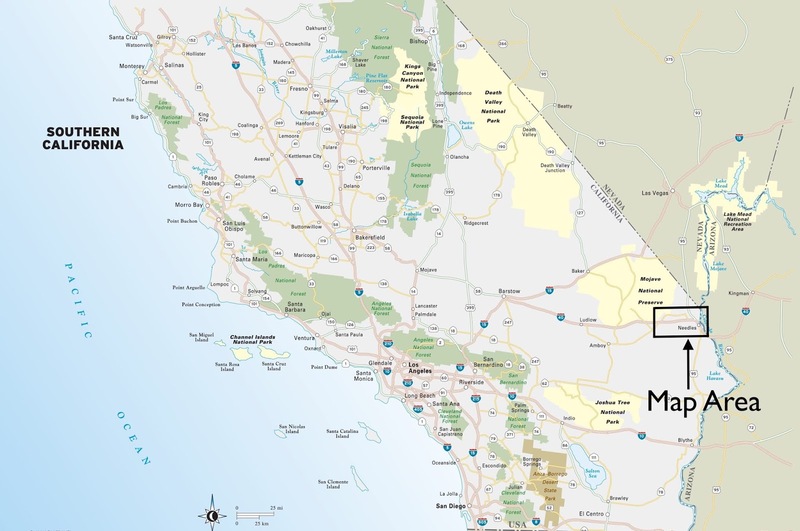 At one time, the Mojave was part of the Basin and Range Country in Nevada, slowing pulling itself apart, but that tectonic activity ceased eons ago. Now the piles of ash stare down silently at trains racing through desolation. Photograph #44: A sundown meet on Ash Hill. If you look closely, you will notice that the westbound train on the right is the same as in Photograph #42, just farther up the hill. Photograph #45: Another meet on Ash Hill. 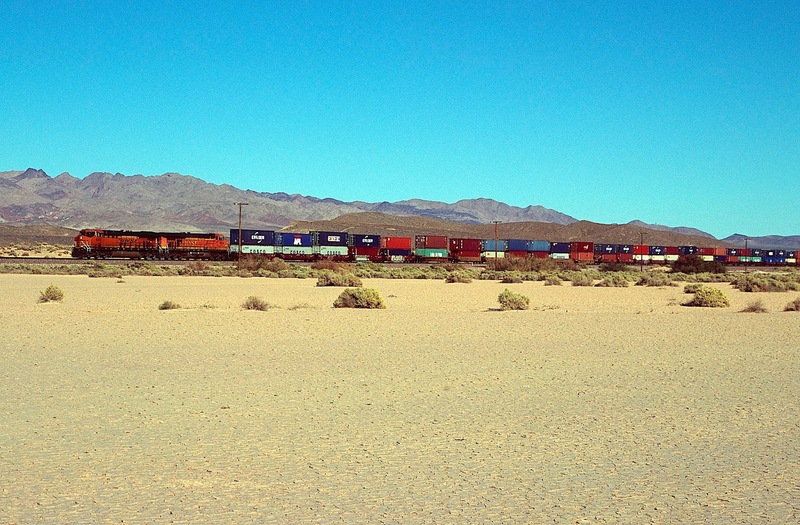 The train on the right appears to the same as in the previous image but is not. Ancient lava coats the foreground. Photograph #46: A meet of manifests on Ash Hill, a rare sight among intermodals. Photograph #47: A westbound has topped Ash Hill and is rolling downgrade toward Ludlow. Photograph #48: Another westbound beneath piles of basalt. Photograph #49: Eastbound autos curve beneath the lava hill at Ludlow. Photograph #50: An eastbound manifest enters Ludlow from the west. 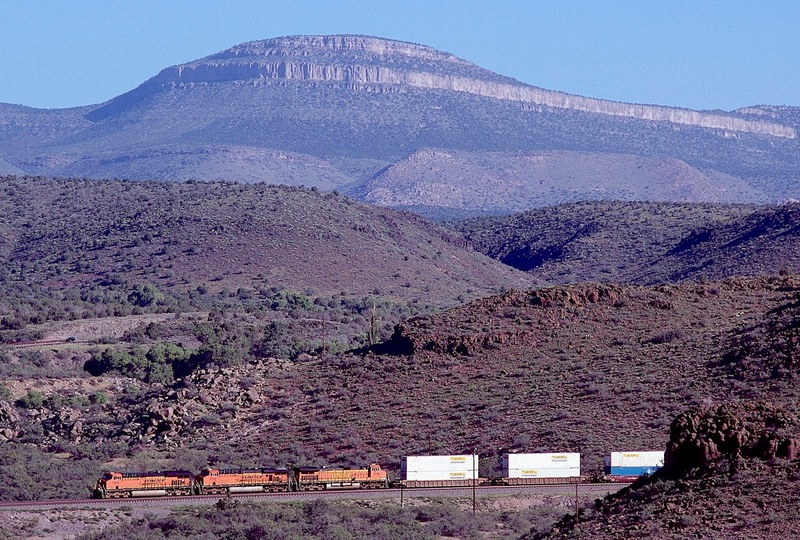 The ridge behind the train is the Pisgah Volcano, which is believed to have erupted three times over the centuries. Some authorities posit that the most recent eruption may have occurred less than 3,000 years ago, though others believe a date of 50,000 to 60,000 years ago is more likely. 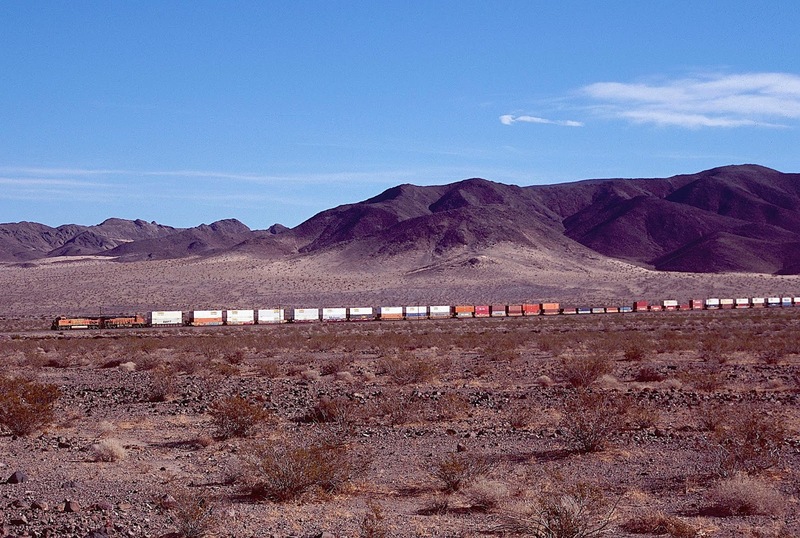 In this section, like indignant desert birds, we continue silently across the barren Mojave in pursuit of the railroad that opened this country to a modicum of settlement. Interstate 40 is now close at hand; civilization seems to be chasing us, though never closing the gap. Even when the highway is not in sight, you can hear the constant clatter of trucks heading to God only knows where. You can also hear the desert laughing: "Not today, not tomorrow, not ever!" 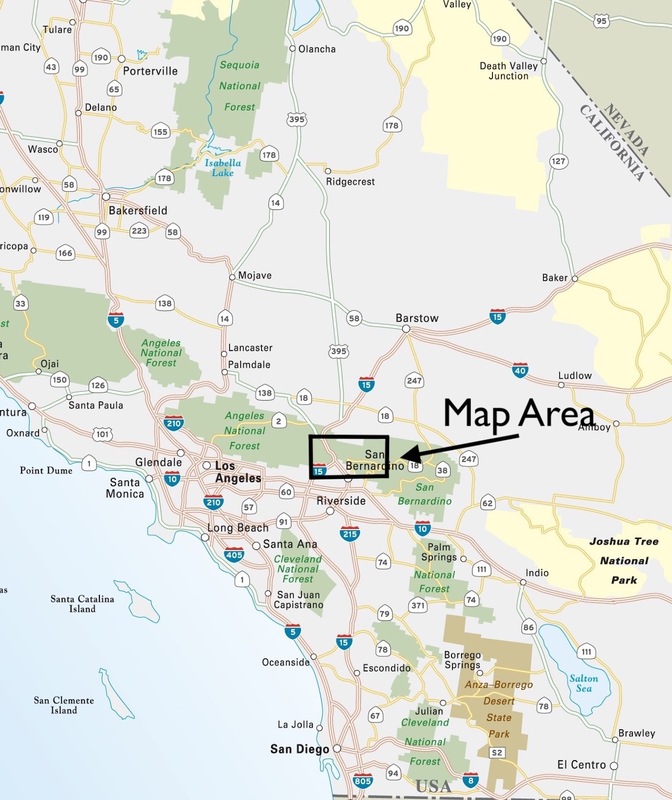 Another note of civilization: on your vehicle's radio, you can now pick up powerful stations from San Bernardino and points south and west. I am listening to a religious program about the Dead Sea Scrolls -- not some crazed preacher screaming about the Holy Spirit (though I have nothing against the Holy Spirit); rather, a sober discussion of life before Christ, when the giant Sequoias in the mountains to the north were already thousands of years old. I change to another station and now am assaulted by someone who thinks the world is going to burn up within ten years unless everyone stops driving cars and using electricity. Bear the Mighty Dog is in the back seat of my Jeep. I ask if he is willing to give up the Jeep, as well as air conditioning and heating. "No," he says silently but firmly. Every hill and mountain that we now see is the result of ancient volcanoes, huge piles of basalt that have eroded over the centuries to form sawtooth ridges. I try to imagine what this country must have been like when all those volcanoes were active. There were no people around; that's for sure. What is most fascinating to me is that the Mojave's mountains are slowly burying themselves in their own debris as storm-driven rocks and boulders pour from canyons, spreading out to build gigantic alluvial fans. Where several deposits join, they form bajadas, long, sedimentary slopes sprinkled with cacti and creosote bush. Bajadas are capped with desert "pavement" -- gravel and small rocks overlaid with thin clay cemented with manganese and iron oxide. The basins in the bajadas have no outlets; thus, when rainfall collects and evaporates, it leaves behind flat alkaline deposits on which almost nothing will grow. The white surfaces of these playas look like ulcers on the back of a wounded bison. The desert valleys are also webbed with lava flows, intricate patterns of varicose veins, some massive, some worn away to almost nothing. In this section, we will see the Transcon crossing both playas and lava flows. 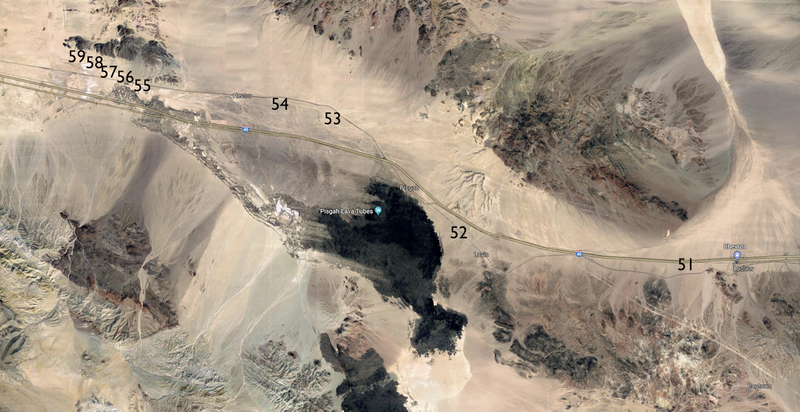 We start just west of Ludlow and proceed to the playa just east of Fort Cady Road. Photograph #51: Stacks with plenty of power are blasting east toward Ludlow. Photograph #52: Westbound stacks are racing past the Pisgah Volcano, which is behind the photographer, who is standing on the edge of the lava field. This image was taken on a cold windy dust-driven day in early April. Bear the Mighty Dog was huddled beneath the photographer's feet, looking up plaintively in obvious discomfort. "Not yet," I told him. "Not yet. More trains are coming!" My excitement was lost on him. 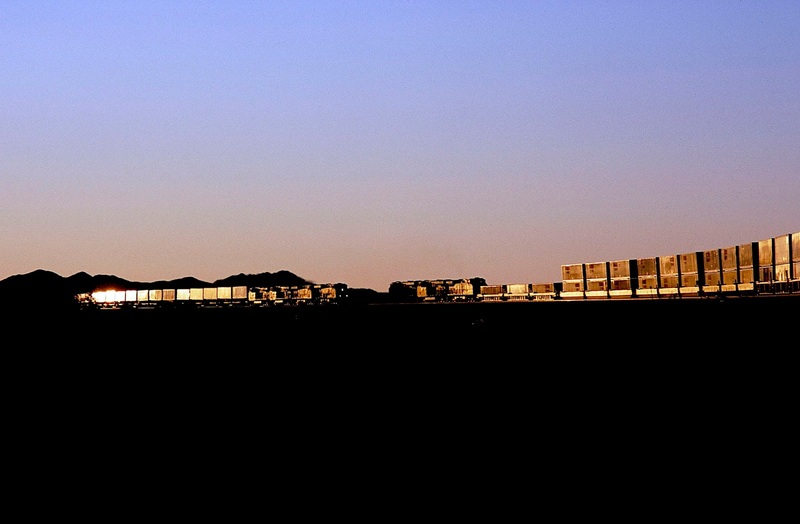 Photograph #53: Westbound stacks in the open desert. Photograph #54: Eastbound autos at dusk. Photograph #55: Eastbound stacks are crossing the edge of a lava flow from Pisgah Volcano. Photograph #56: Eastbound pushers are preparing to cross the same ancient lava field after an encounter with one of the many playas (dry lakes) that dot the desert like snow. 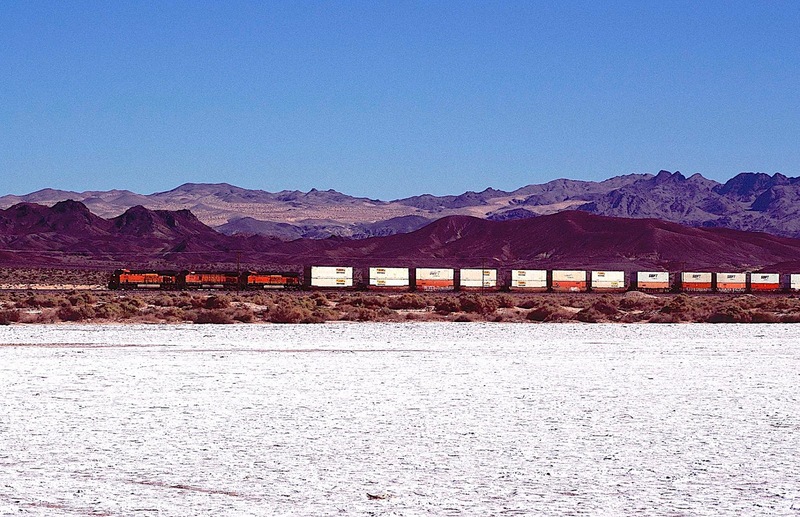 Photograph #57: BNSF 8255 West is crossing the beginning of a playa which, though stone dry, has not yet begun to alkalyze. 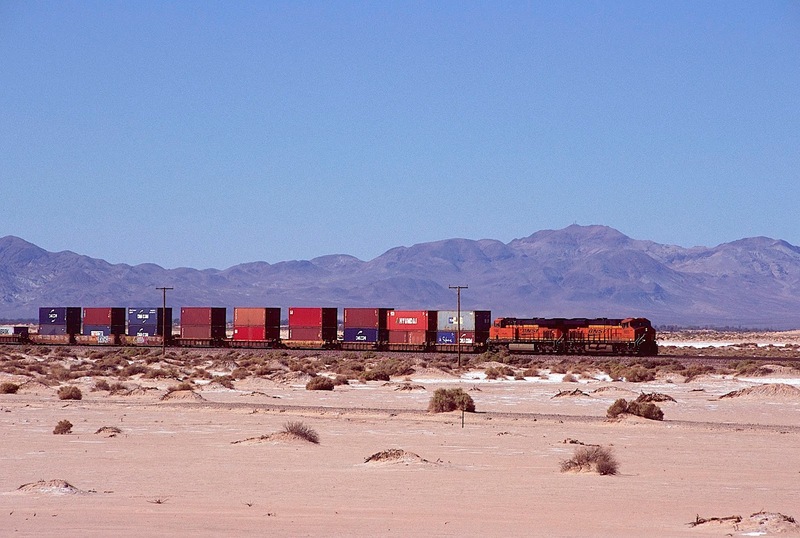 Photograph #58: Eastbound stacks are crossing a playa that has begun to alkalyze. This image was taken in November. In summer, the reflective heat off this dry lake would be unbearable. 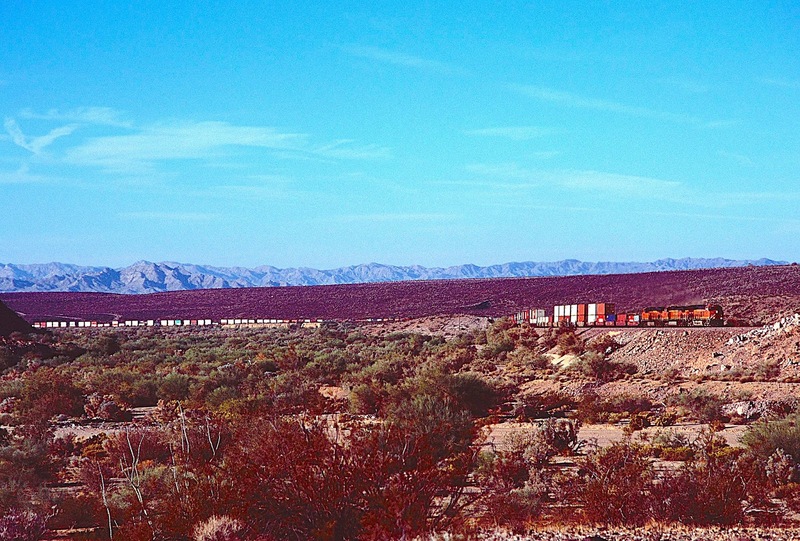 Photograph #59: Westbound stacks beside a fully alkalyzed playa, with more mounds of volcanic detritus in the background. The ground under the alkali was about half mud, into which I sank almost to the tops of my boots. My Jeep Rubicon made it out after a serious struggle. For a time, I thought I might be spending the night. West of this playa, the land begins to change as we approach Barstow. Since I prefer images from the unvarnished countryside, I have never ventured into Barstow for photography. You will have to excuse me, but that's the way I am. So we next pick up the Transcon on the southwest side of town -- back in the open country. My first real contact with California occurred in 1969 when I drove across the Southwest from my home in Oklahoma to attend Stanford University in Palo Alto. My mother's older sister and her husband had lived in the Los Angeles basin for years, and my family had visited once when I was ten, but I really knew nothing about the Golden State. I lived there four years and came to know the area reasonably well -- reasonably well for someone not a native with no intention of settling. But I believe I was there long enough, learned enough about the geology and the climate, to state with some certainty that the California I came to know no longer exists. It was already changing when I first arrived. The California I remember was a vast agricultural wonderland, with roadside stands every mile or so selling truck crops for almost nothing, as though produce rained out of the sky in this marvelous state. When you drove into California, you stopped at an agricultural check point, and uniformed inspectors examined your vehicle to be certain that you were not transporting any fruit or vegetables that might contaminate the local products. Orange County was covered with orange groves, as were the southern reaches of San Francisco Bay. While in college, I played on the golf team, and I remember one tournament near San Jose on a course in which each fairway was lined with orange trees. The geology was spectacular, with grass-covered hills and mountains rising in front of your eyes like clouds. The weather in the inland valleys near the ocean was equally spectacular -- warm days and cool nights, little winds, bright sun, rain only in the winter, never ice or snow. Never too hot. Never too cold. Water was brought in aqueducts from the mountains, cool clear water, pristine, as though anointed by God, water that had turned semi-arid deserts into paradise. Even in 1969, however, cracks were showing in the facade, like a classic movie theater beginning to suffer from lack of maintenance. The roads were very crowded. The faster the state built new freeways, the more crowded the roads became. It seemed that the building of roads simply encouraged more people to drive. I once took a trip to the Calaveras County Fair in Angels Camp in the heart of the Mother Lode -- made famous by Mark Twain in his story about the amazing jumping frog. I thought I would be a million miles from nowhere and have the Sierra foothills to myself. Wrong. Motorcycle gangs by the thousands had descended upon the tiny town. The air was full of blue exhaust smoke and marijuana. The bikes were so loud, a constant din like a thousand locusts, that you had to shout to be heard. And the people were not friendly, at least the people that I met. When I told them I was from Oklahoma, they almost invariably said, "Why would anyone live there?" The agricultural wonderland was fast being replaced by metastasizing urbanites who seemed hell bent on consuming everything in sight. My worst fears were ultimately realized, because today when you drive through most of California, the orange groves and truck farms are gone, replaced by wall-to-wall housing and freeways. The golf course with fairways lined by orange trees has been replaced by a mall with a gigantic parking lot. And the people have not grown any friendlier. 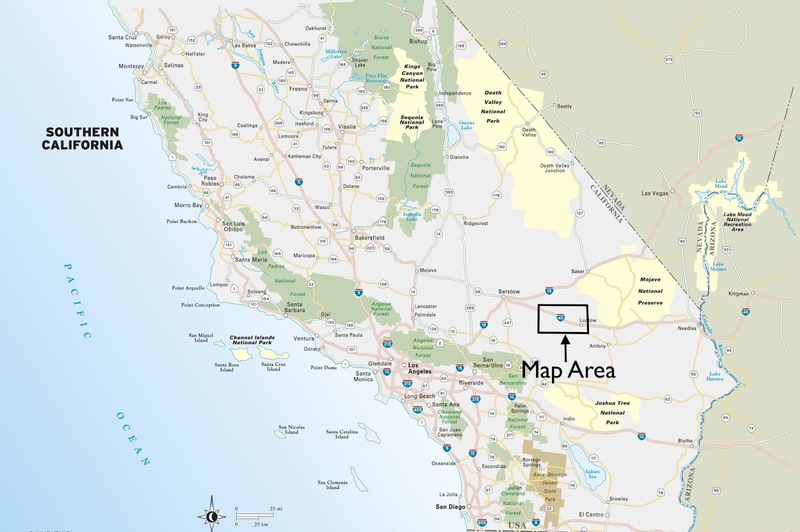 I have made this long digression to point out that the portion of California covered by this section of our Transcon survey still retains the flavor of the California of 50 years ago. 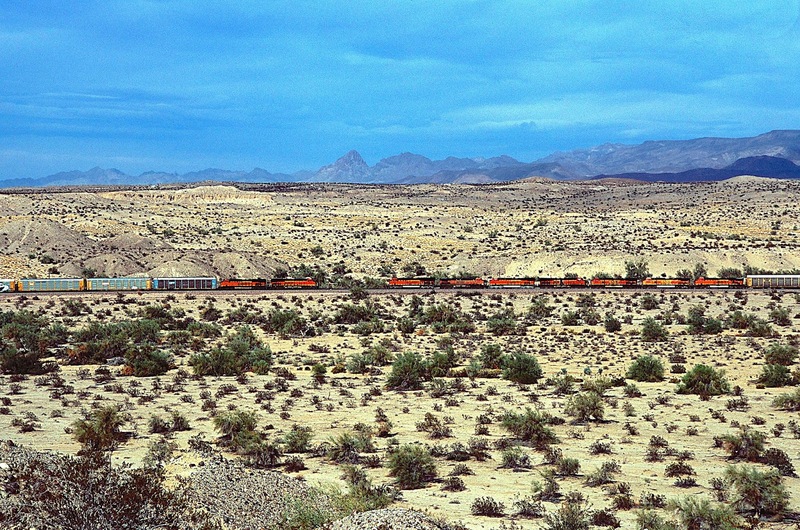 Here the tracks are running southwest through the valley of the Mojave River, dry almost the entire year except during the brief "rainy" season in winter. But there is enough sub-surface water to support limited agriculture and pasture for horses and cattle -- even in the heart of the desert. Once you leave Barstow and the Interstates, you find yourself in a country not nearly as harsh as the desert to the east, with trees in the river bottom, farms, ranches, scattered ranch houses and clear blue sky. 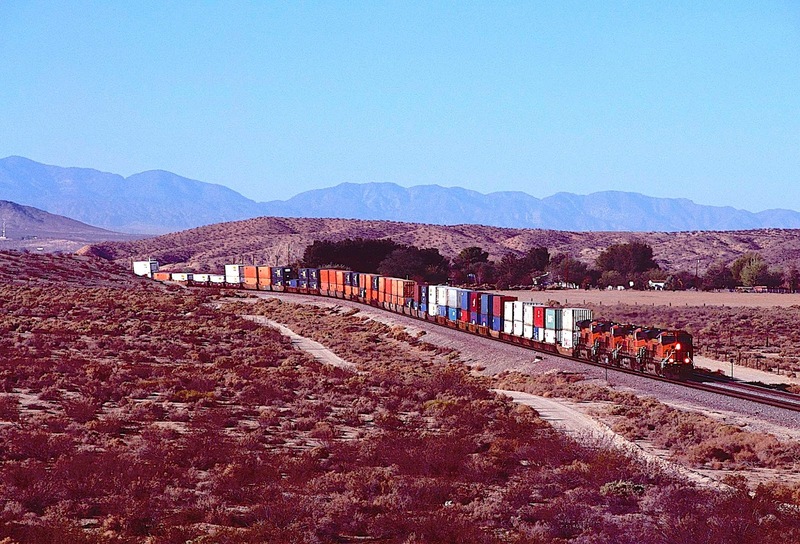 The march of California is not far away --Interstate 15 and its associated restaurants, gas stations, motels and outlet malls; in fact, when the wind is down, you can hear trucks in the distance. But along the Transcon, at least for the time being, you are in another world, which may or may not survive. 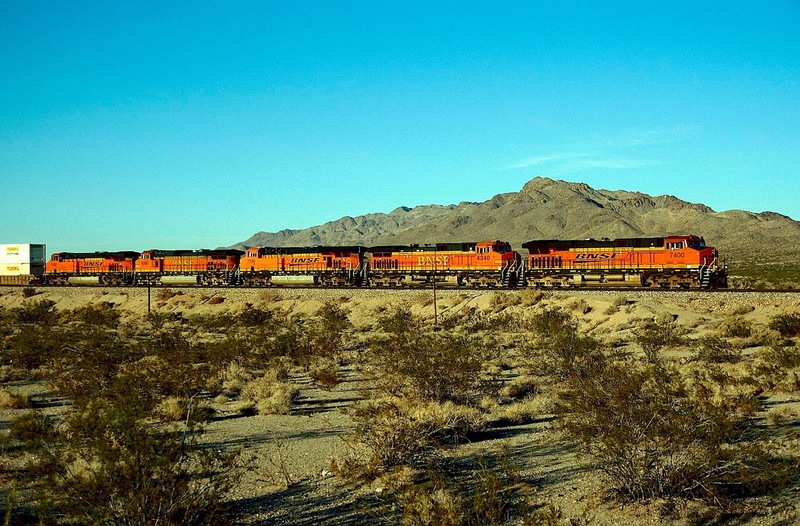 Photograph #60: A westbound Z-train is heading toward Cajon. In the background stand Eucalyptus trees and a ranch irrigated with ground water from the Mojave River. In the foreground is the unwatered desert. If you look closely, you will see several dogs who came out to say hello to Mighty Dog. After staying a while, they decided to head back to the ranch. 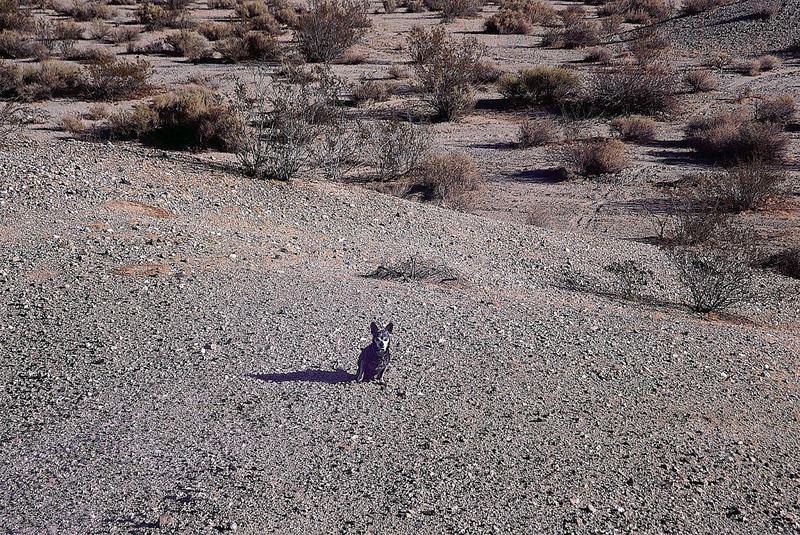 Photograph #61: Bear the Mighty Dog alone in the desert. 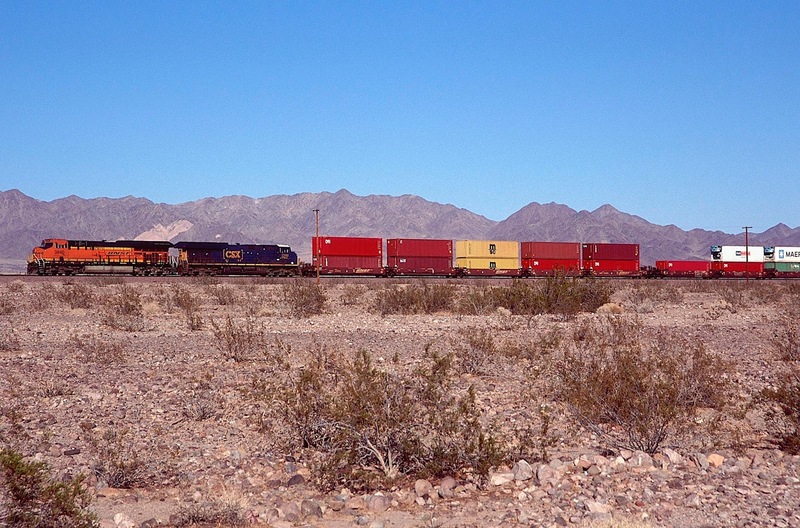 Photograph #62: Eastbound stacks (compass northeast) are rolling toward Barstow. Beside them lies another ranch, while in the background stand the San Gabriel and San Bernardino Mountains, between which the Transcon navigates down Cajon Pass to the Inland Empire and Los Angeles Basin. 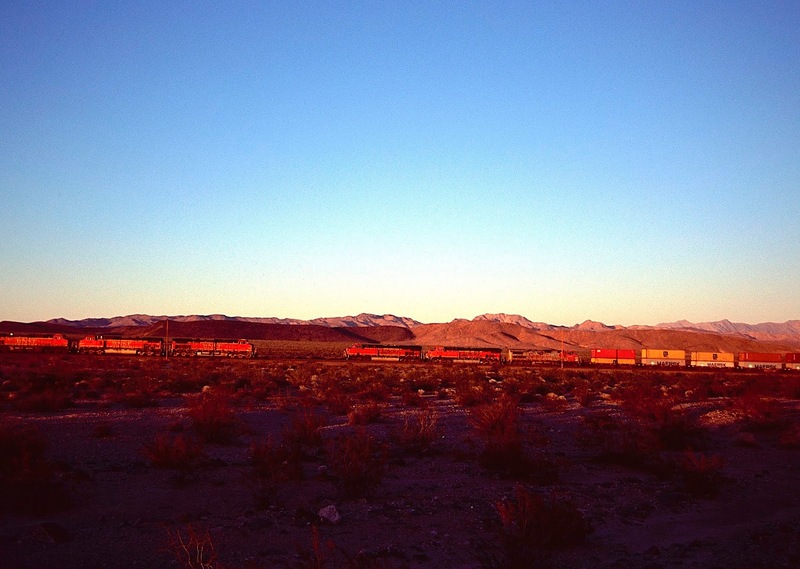 Photograph #63: At dusk, westbound stacks are headed to San Bernardino. 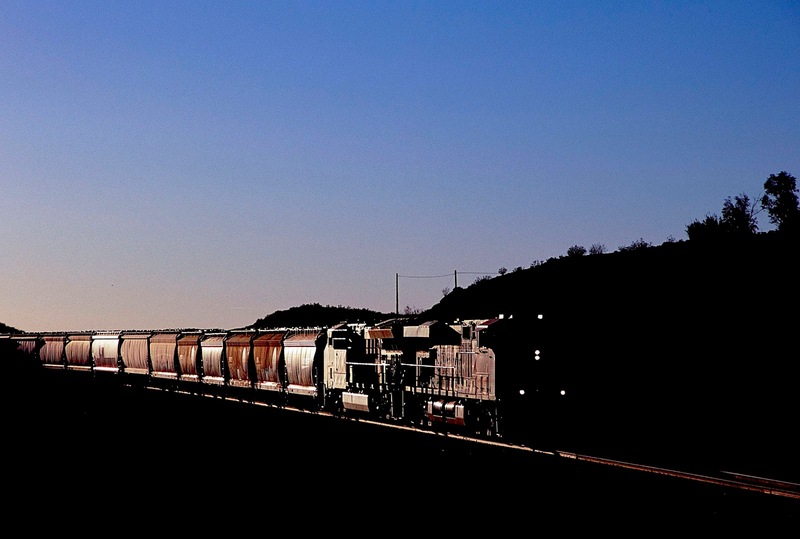 Photograph #64: At dusk, eastbound grain speeds past a small hill. 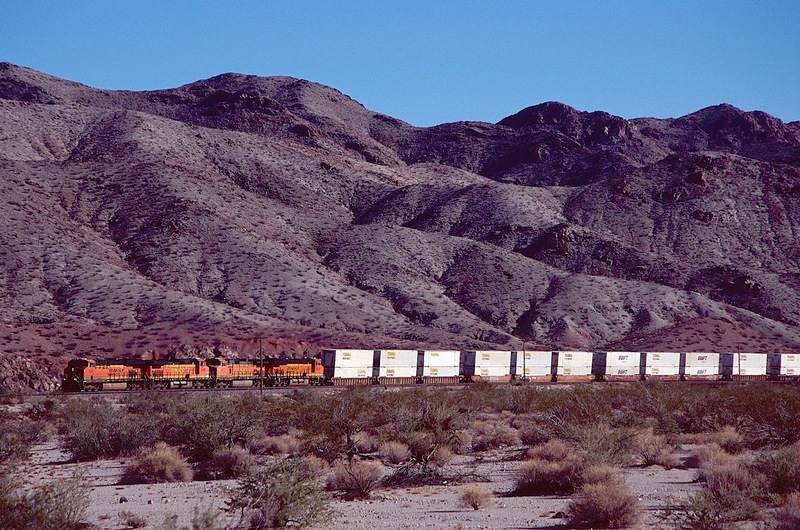 Photograph #65: Two eastbound trains are stopped, awaiting clearance to the yard at Barstow. Between them a westbound mineral train is gliding down a small incline. The hill on the right side of the image is where the immediately preceding photo was taken. Notice the house on the top, plus the house on top of the hill to the left. Photograph #66: A westbound Z-train is passing the house on the hill on the left side of the image immediately above. Obviously, the driveway climbing the hill never sees ice or snow. 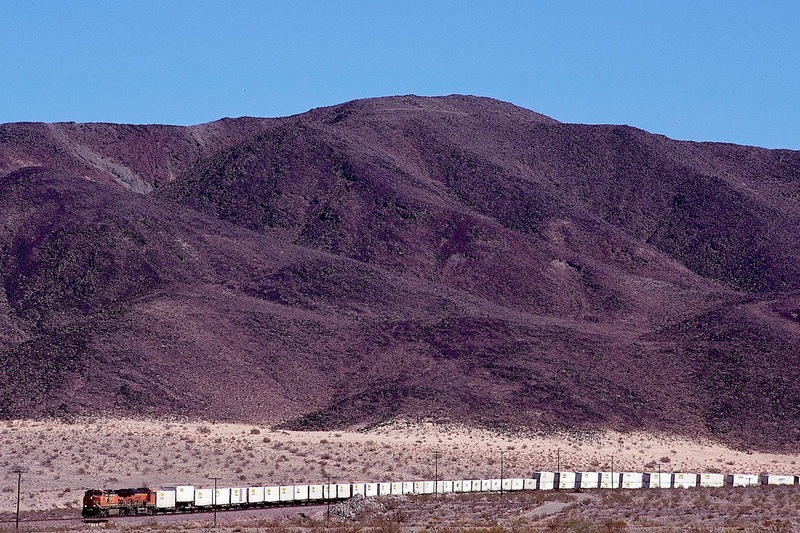 Photograph #67: Eastbound trailers at Helendale -- along the Mojave River. 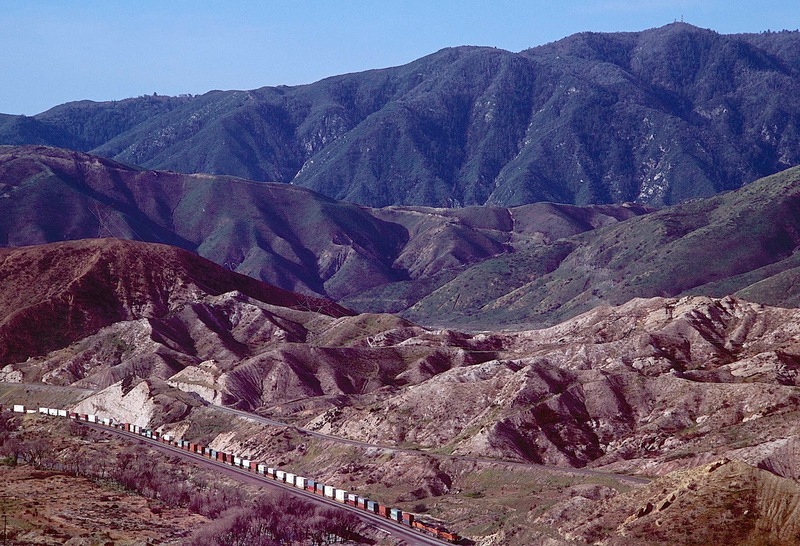 Past Helendale, the Transcon and the highway beside it become steadily more congested, though it is the congestion I remember from my college days -- small houses, cabins, gas stations, farms, ranches, restaurants. The road was originally the National Old Trails Highway, the original route across the western United States to California, long since replaced by Interstate 15, so some of what you see today is often in various stages of disrepair, especially the old gas stations, nothing at all like the shiny opulence of California's oligarchs today. Still, it does bring back memories. 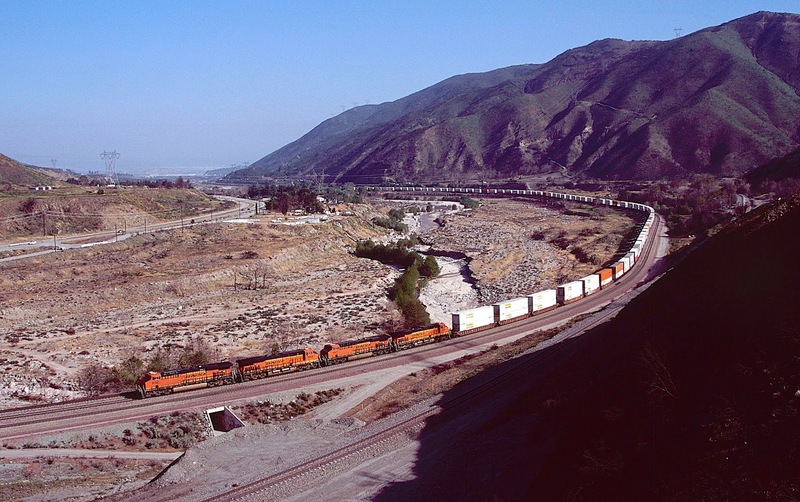 I have previously published two posts on Cajon Pass. 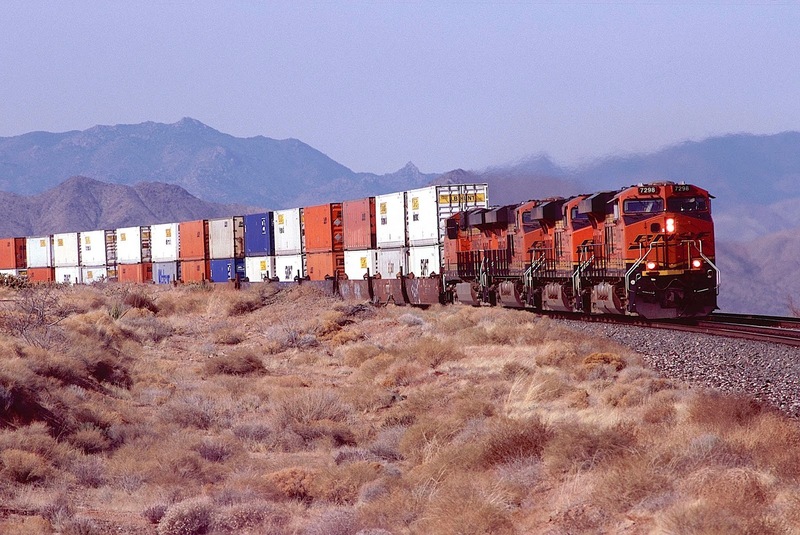 One includes images taken before the Blue Cut Fire of August 2016: https://www.waltersrail.com/2016/11/cajon-2016-before-fire.html. 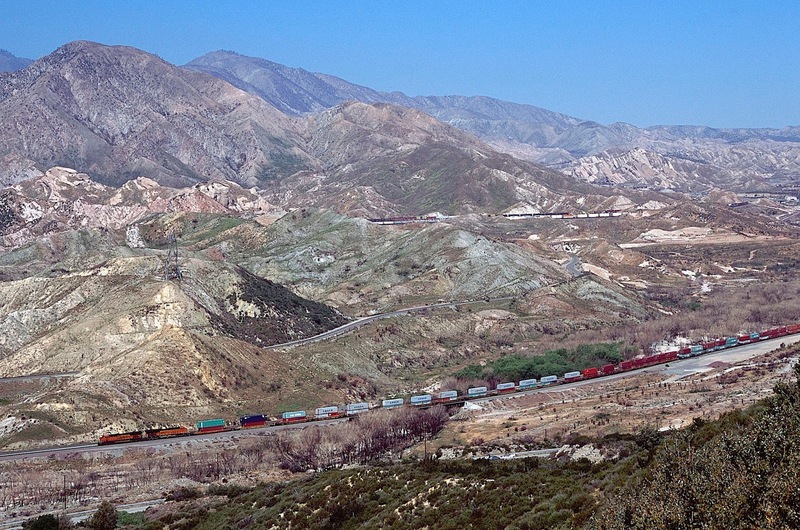 The second post includes photographs taken the April following the conflagration: https://www.waltersrail.com/2017/06/cajon-pass-after-fire_29.html. Those posts cover the Transcon in significant detail, as well as discussing the history and geology of this most amazing region, where the North American and Pacific plates are grinding past each other along the San Andreas and many other faults. I will not repeat those discussions. I will simply say that I know of no other railroad line in North America that crosses such geologically disturbed territory. As you view the following images, try to imagine what in the world has caused the land to deform itself in such tortuous ways. In earlier epochs, we might have hypothesized that gods had fought here, slamming each other into the ground over and over until the soil and clay and rocks rose up toward the sky high enough so that snow could fall in Southern California. We now hypothesize that as the Pacific and North American plates lurch past each other, one earthquake at a time, land is pushed skyward on each side of the faults to create the San Gabriel and San Bernardino Mountains, which as soon as they begin to lift also began to erode, creating what the Spanish call sierra -- the serrated edges of all those craggy western peaks. 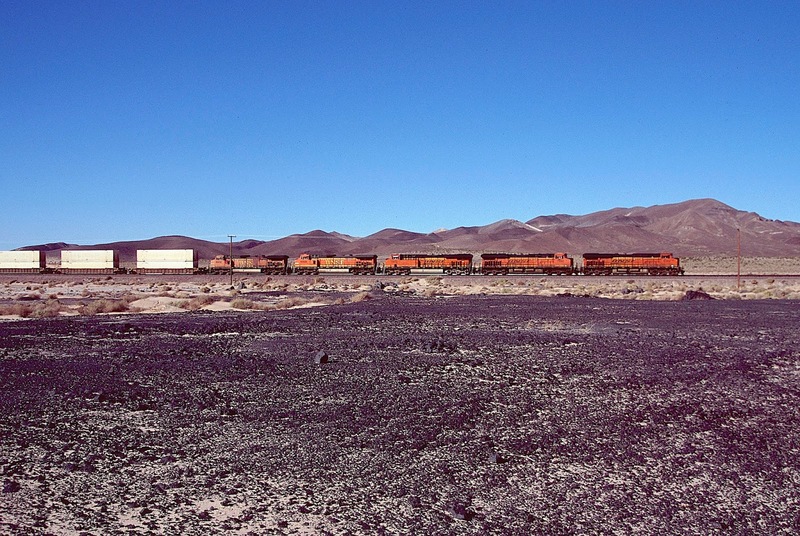 The original Atlantic and Pacific line through the pass was constructed in 1885. With a maximum grade of three percent, this route was an operational nightmare, so in 1913 AT&SF constructed a second route on a shallower, though still steep, grade. This line was subsequently double-tracked to Summit. 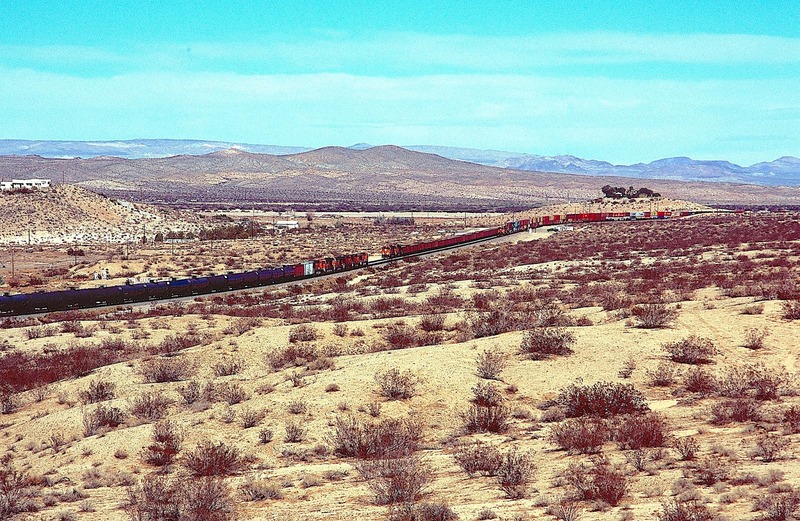 In the 1960's, Southern Pacific constructed its own line from Palmdale across the desert and down through Cajon Pass to allow freights from the Central Valley to by-pass the congestion of the Los Angeles Basin on their way east. 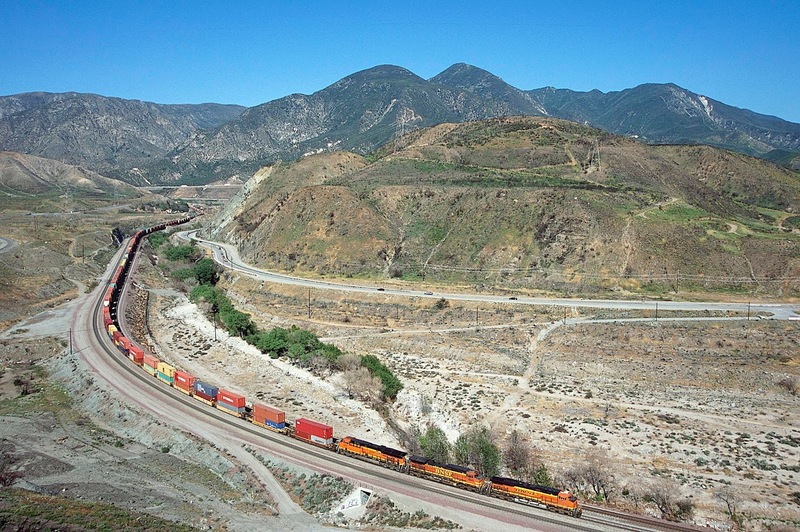 Union Pacific now operates this "Palmdale Cut-off." But enough of this. Let's allow the images to speak for themselves. 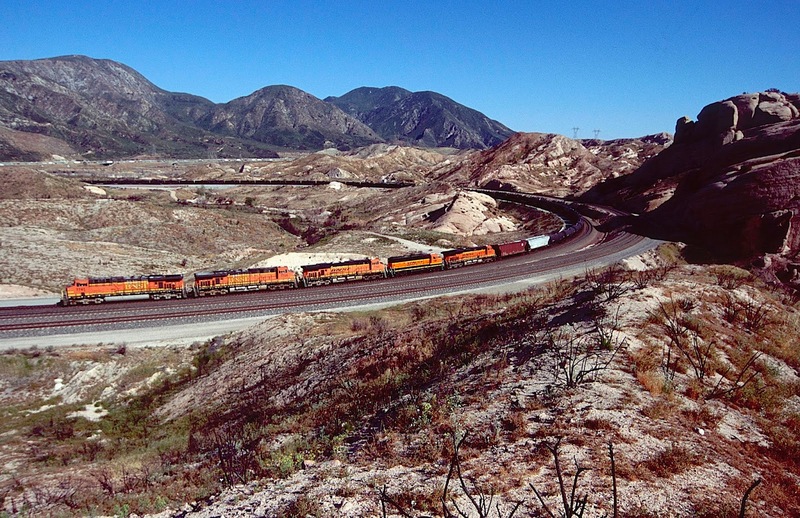 Photograph #68: BNSF 6613 East has just crested the summit of Cajon Pass and is racing downgrade toward Victorville. 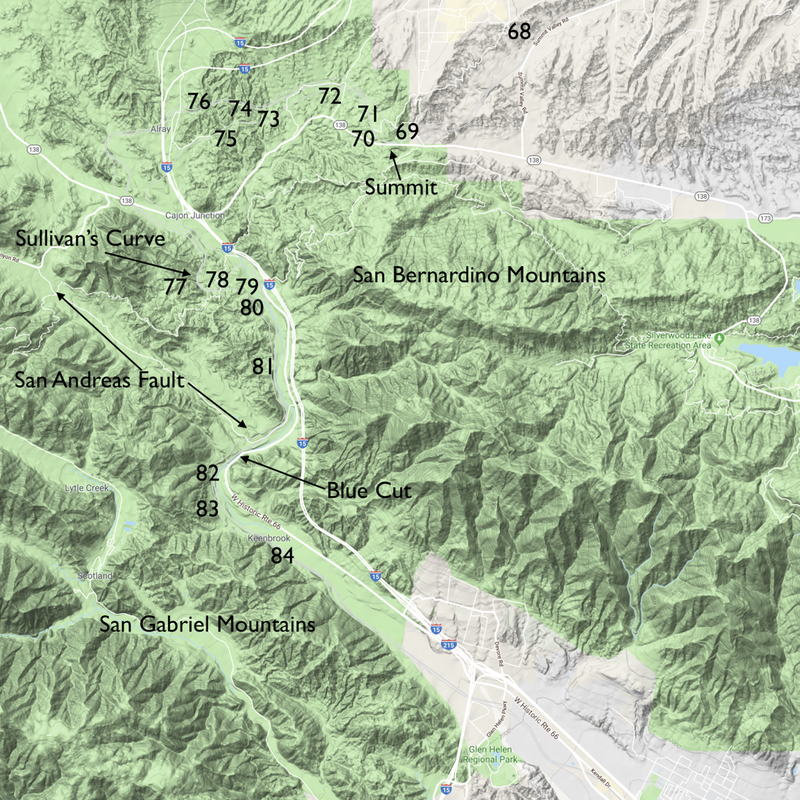 The San Gabriel Mountains rise in the background, partially shrouded by fog blowing up from the valley below. Photograph #69: Two trains meet at Summit. 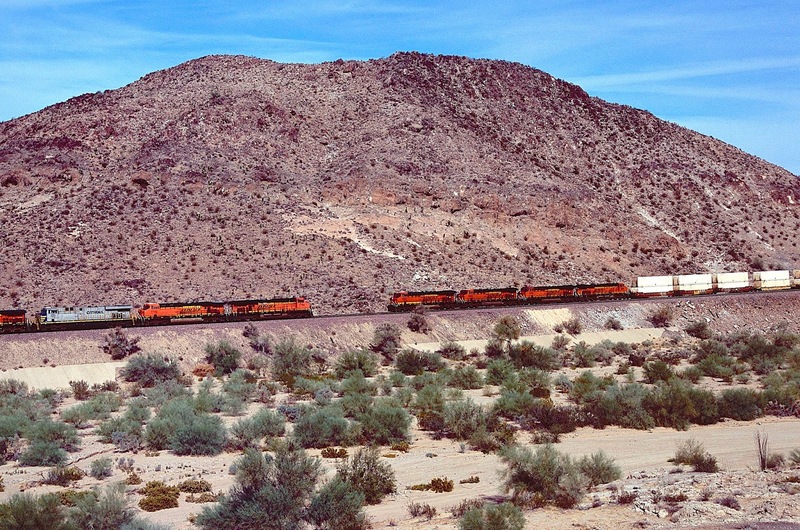 The grain train in the background had stopped to allow three westbound intermodals to pass, and it had some difficulty re-starting on the steep grade. Photograph #70: An eastbound approaches Summit. Behind and above are the two levels of Interstate 15. 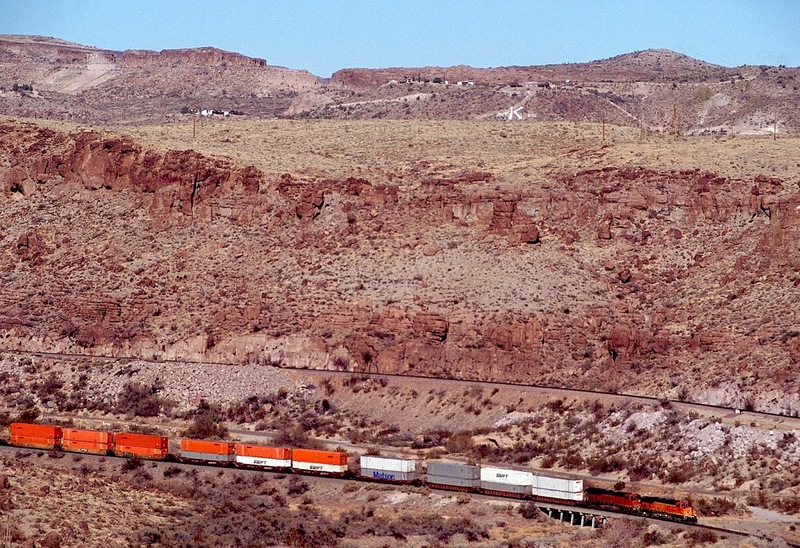 Photograph #71: Two BNSF freights meet just below Summit. UP's Palmdale Cut-off is in the foreground. In the background stand the San Gabriel Mountains. Notice the stark and continual deformation of the landscape, as though someone were playing Whack-a-Mole with a huge mallet. Photograph #72: Westbound stacks have crossed the summit just around the curve in the rear of the train and are rolling downgrade in dynamics on the three percent grade of the original 1885 alignment. 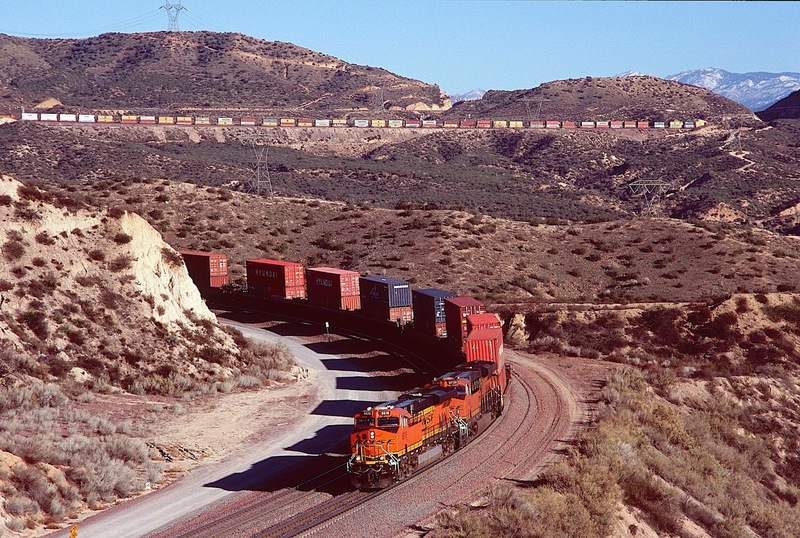 Between the stacks and the photographer are the 1913 alignment (now double track) and UP's Palmdale Cut-off. 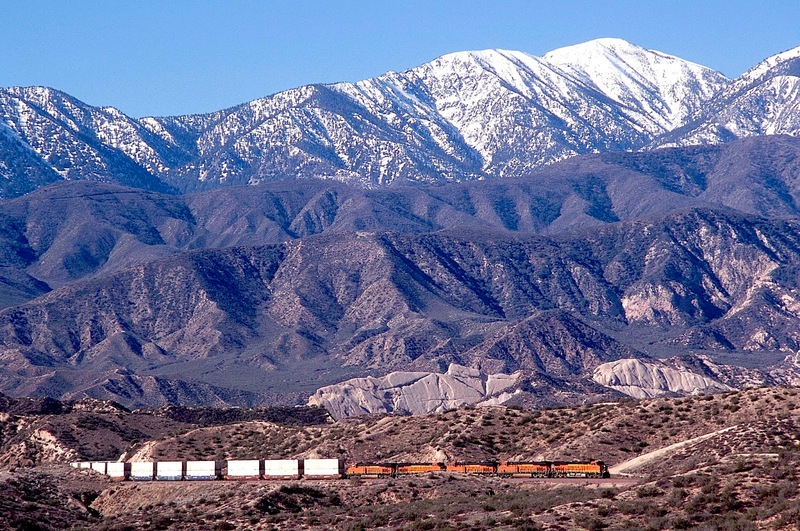 The rugged San Bernardino Mountains are in the background. Photograph #73: More westbound stacks, this time on the 1913 alignment. 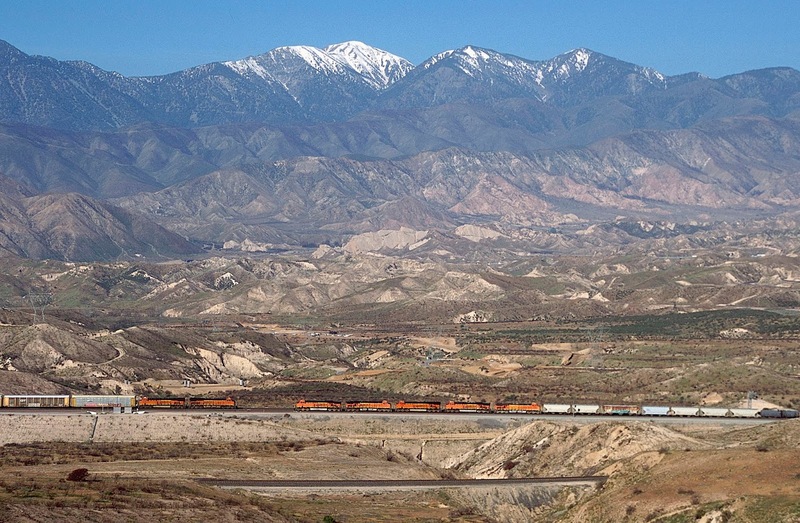 Photograph #74: BNSF 3902 East is climbing Cajon Pass with the San Gabriel Mountains in the background. 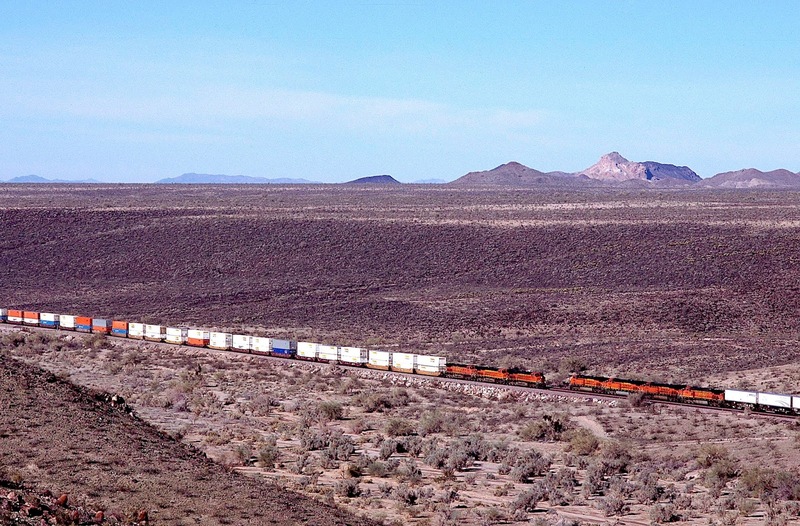 Photograph #75: An eastbound Z-train is on the three percent grade of the 1885 alignment. Photograph #76: BNSF 7557 East leads stacks through the day-lighted tunnel at Alray. 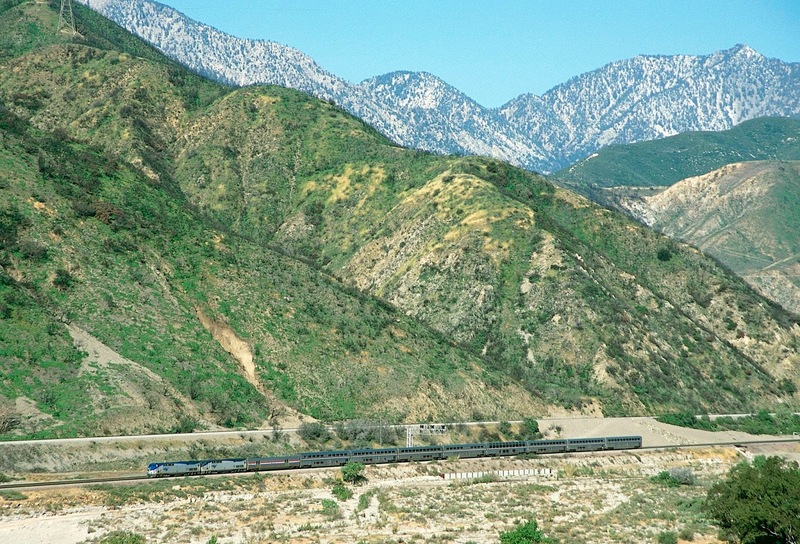 Immediately above the train is the Palmdale Cut-off. 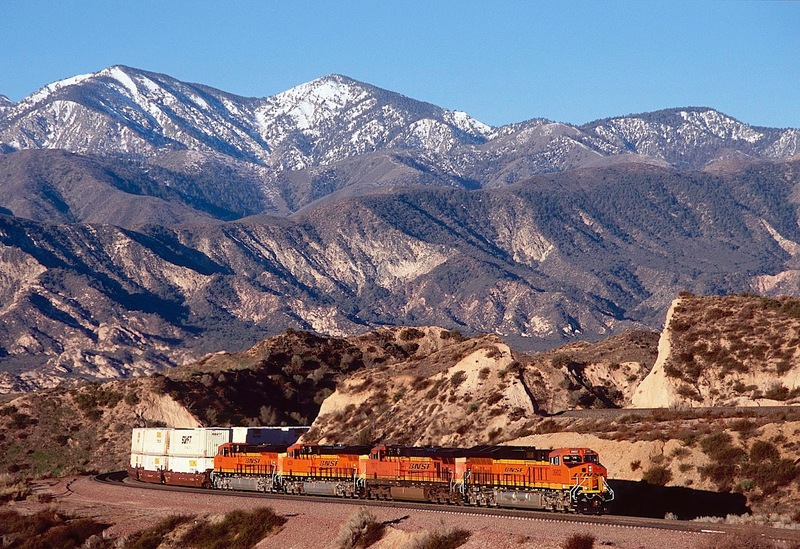 I often wonder if an especially heavy rain, not unusual during the winter in southern California, might bring the UP tracks sliding down upon the BNSF. So far, that has not happened. Photograph #77: An oil train is grinding through Sullivan's Curve, part of the 1913 alignment to decrease the eastbound grade. UP's Palmdale Cut-off is in the foreground on a slightly higher level. Immediately in front are some of the burned creosote bushes from the Blue Cut fire. 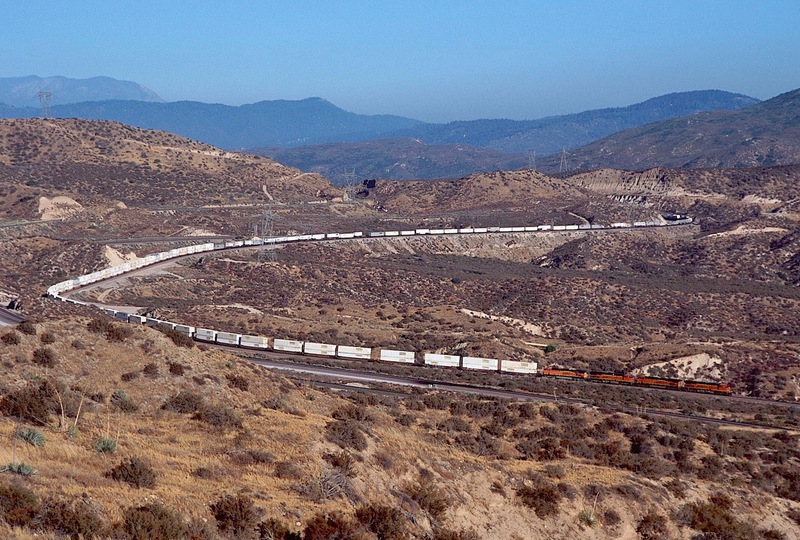 Photograph #78: A westbound stack train in full dynamics circumnavigates Sullivan's Curve, as seen from the San Bernardino Mountains on the other side of the San Andreas Fault. Photograph #79: Westbound stacks are gliding downgrade. 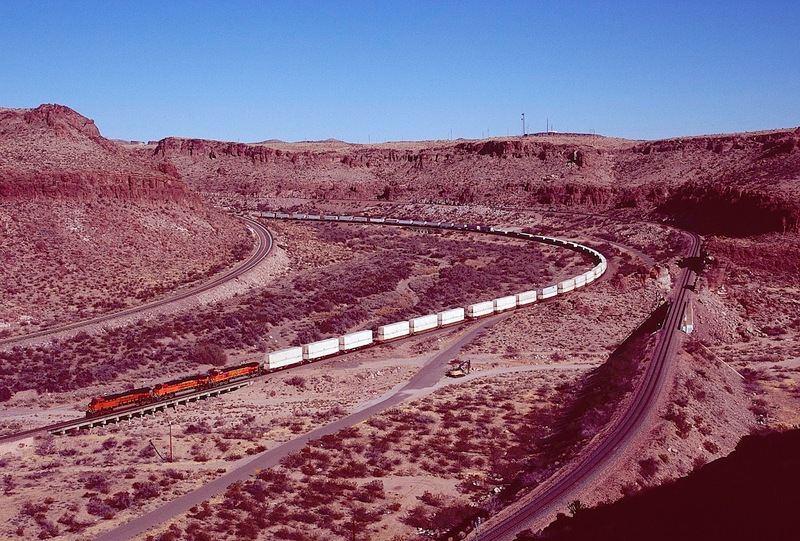 In the upper portion of the image, an eastbound train is grinding through Sullivan's curve. Photograph #80: Union Pacific meets BNSF below Sullivan's curve. This image was taken before the Blue Cut fire. Photograph #81: Eastbound stacks have just navigated through Blue Cut -- a slice in schist visible in the middle left of the image. Schist is formed when mudstone is placed under enormous pressure. Mudstone itself is rock formed when mud and clay are compacted underground. Thus, the rock through which Blue Cut slices appears to have been formed by detritus washing down from the surrounding mountains, buried under pressure for millions of years, then eventually coming back to the surface as everything on top eroded away. Blue Cut itself appears to be a water gap, likely created by enormous water pressure backing up behind the schist, giving some idea of the incredible geology of this place, as well as the remarkable changes in climate seen by Cajon Pass over the eons. Photograph #82: Looking east toward Blue Cut. The San Andreas Fault runs through the middle of the cut; it may have contributed to the tectonic pressures allowing water to slice through the schist. 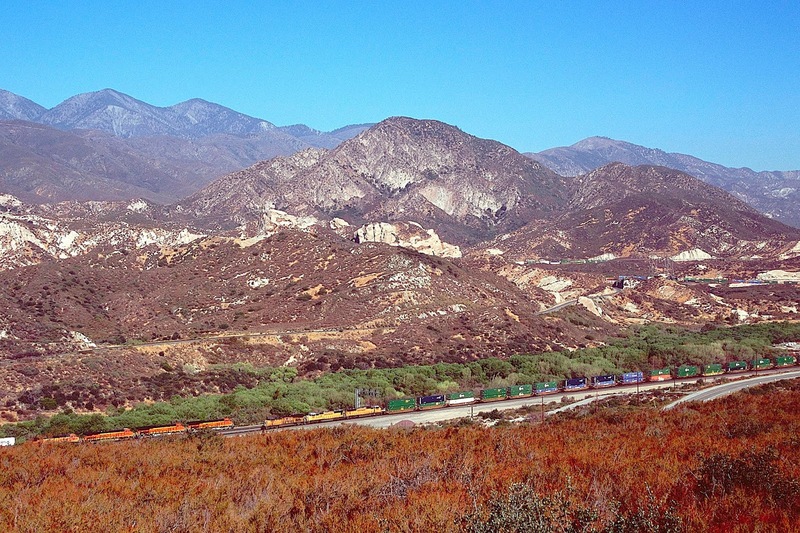 Photograph #83: This is the entrance to Cajon Pass. Eastbound stacks have just come up from San Bernardino and are making the turn to Blue Cut. 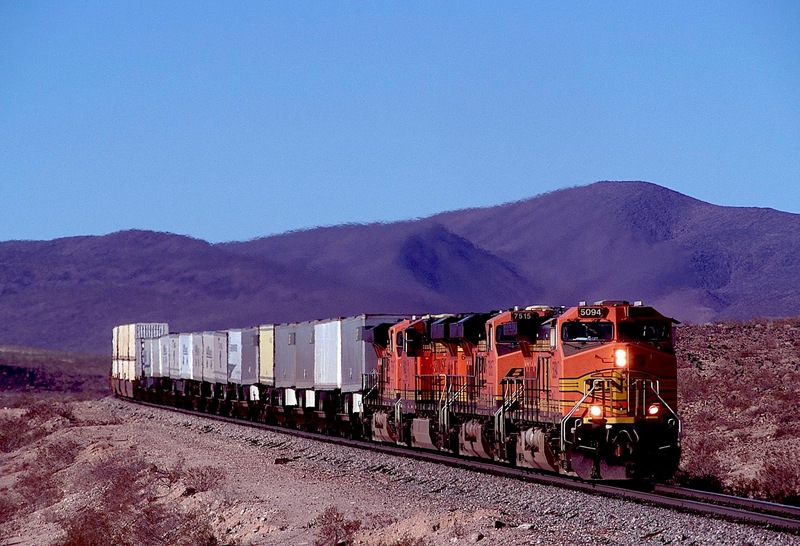 In this location, the BNSF line is triple track, and every track is extremely busy. 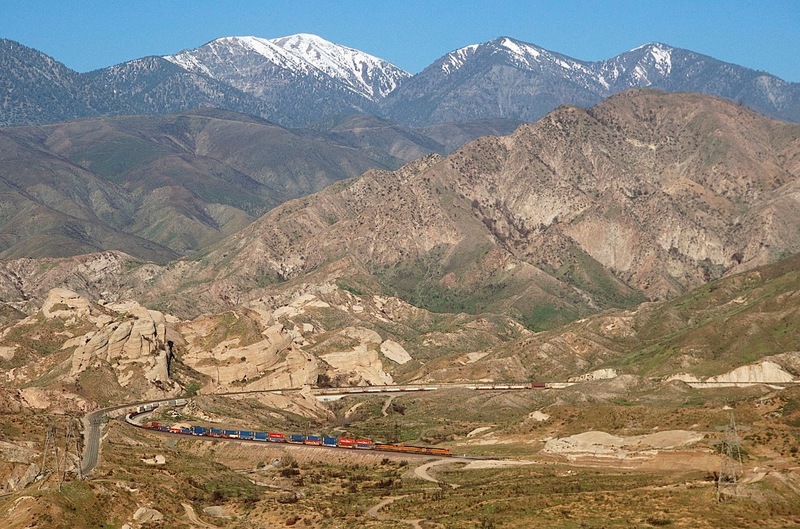 Photograph #84: Amtrak's westbound Southwest Chief (Train #3) is leaving Cajon Pass, with the San Grabriel's in the background. 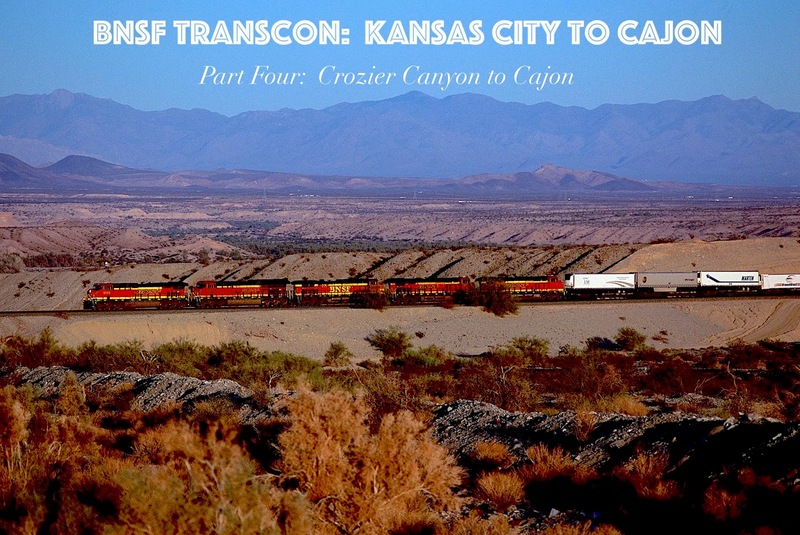 We have come to the conclusion of our four part survey of BNSF's Transcon from Kansas City to Cajon. All that is left are the maps of Cajon Pass. If you have struggled through all four parts, you (as do I) clearly have too much time on your hands! Nonetheless, thank you for the struggle. To view my other posts, go to waltersrail.com.